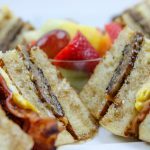 French Toast Club Sandwich – Helloooo, Breakfast for Dinner! 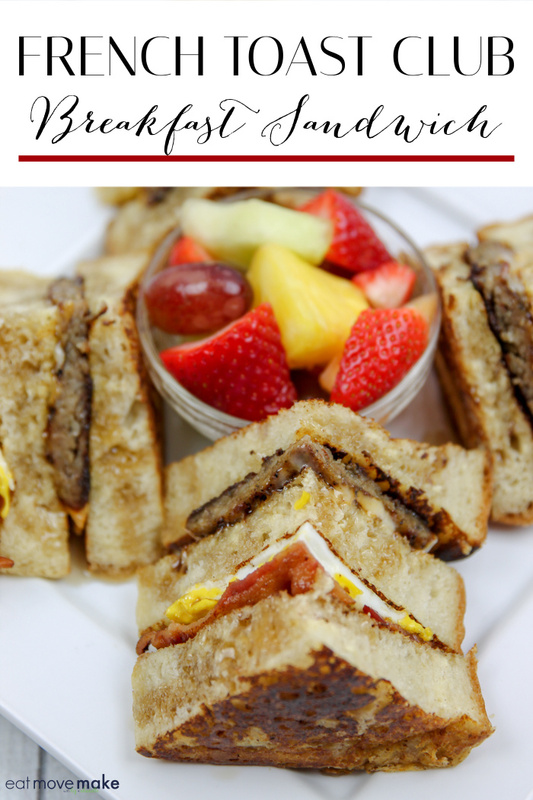 All of your breakfast favorites come together in this French toast club sandwich, a breakfast sandwich you’ll never forget. 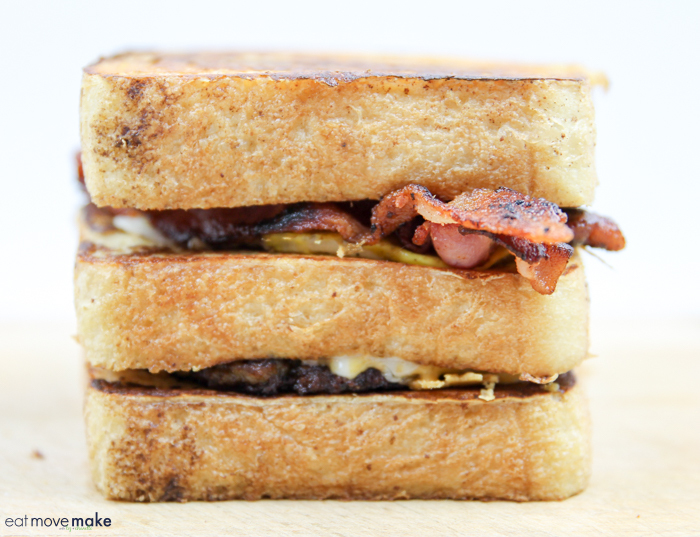 Stack up some crispy bacon, sausage, cheese, a fried egg and freshly griddled French Toast. Then drizzle (or douse) the whole thing with maple syrup. It doesn’t get much better than this, folks! The key is to find a really good bakery bread. 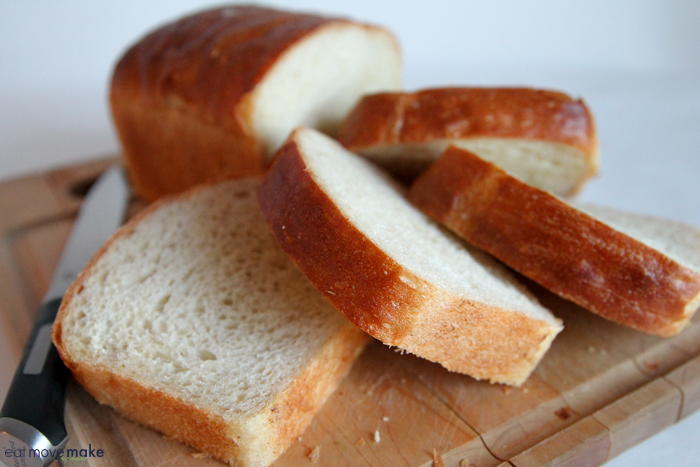 Don’t use regular sliced bread… it won’t be the same! I popped into a bakery and found the perfect French loaf which I cut into thick slices. I cooked some sausage patties and bacon on my electric griddle and fried one egg per sandwich. 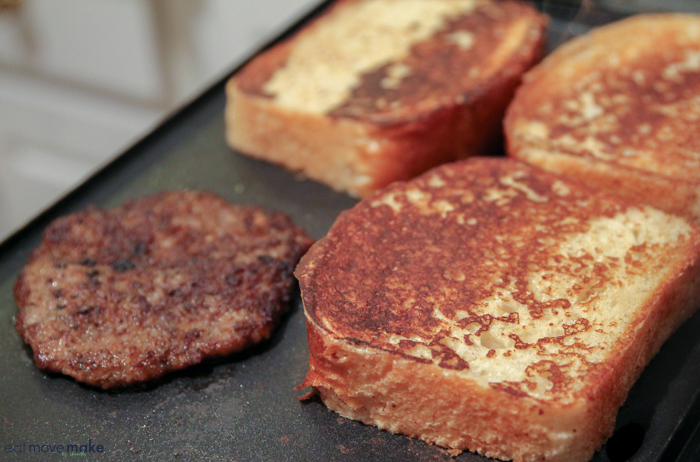 Then I dunked my bread slices into an egg mixture and griddled them until they were a delicious golden brown. Next, I stacked everything club sandwich-style, secured it with sandwich picks, and cut into fourths from corner to corner. Once on a serving plate, everyone can add as much or as little maple syrup as desired. The sweet and savory combo is to die for! 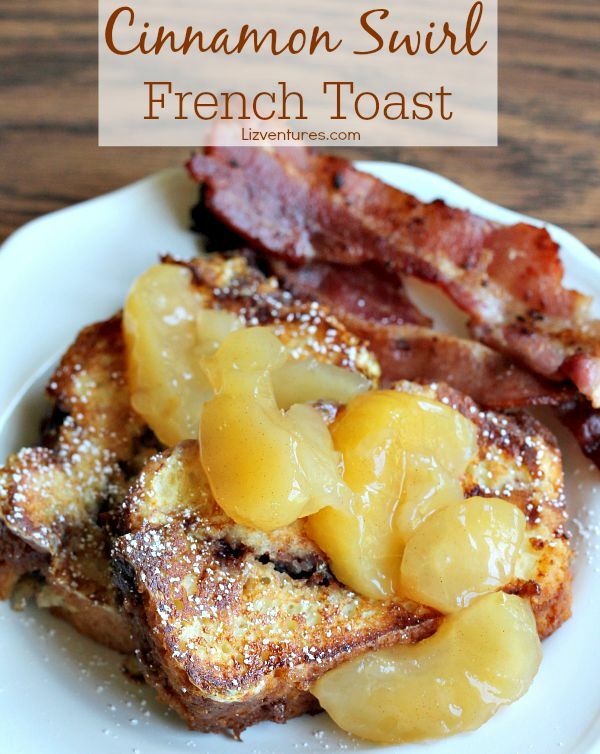 Pin this French Toast club sandwich and share this post with your friends! Slice French bread into 9 slices. Set aside. 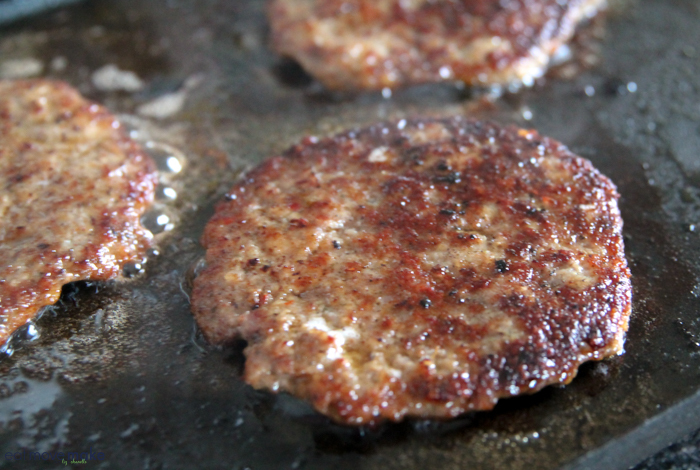 Form sausage into very thin and large patties (like hamburgers) so that they'll cover a whole slice of bread. Fry the sausage and bacon until cooked. Add a slice of pepper jack cheese to each sausage when cooked and let melt. Beat together 3 eggs, milk, vanilla and cinnamon. 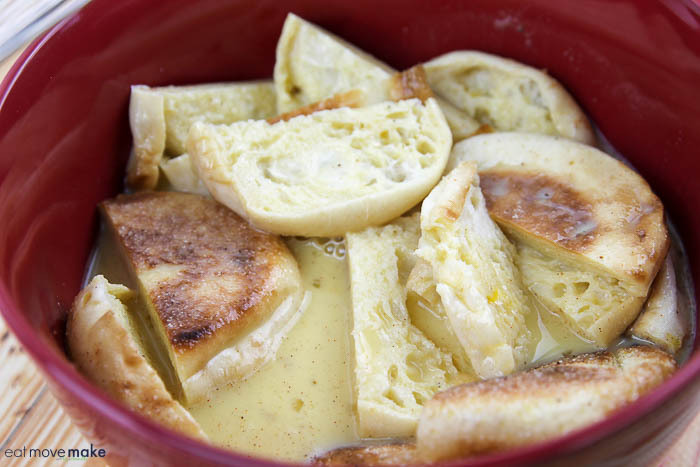 Dunk the bread slices into the egg mixture and cook on the griddle until golden brown and firm, not soggy. Flip and cook other side of French Toast. While doing this, fry eggs on griddle. 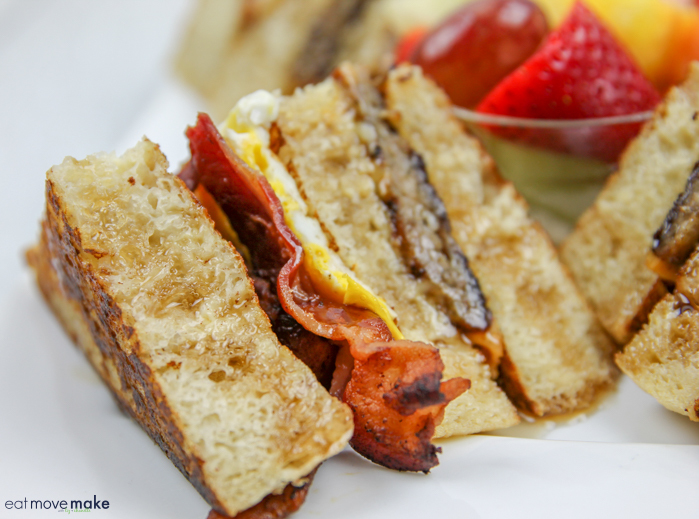 Assemble French Toast Club sandwich from bottom to top: toast slice, sausage and cheese, toast slice, egg and bacon, toast slice. Secure with toothpicks, then cut corner to corner into fourths. Serve with maple syrup. Once the sausage and bacon is ready, I find it easier to focus on making one sandwich at a time, so I griddle three slices of toast and one egg, stack a single sandwich, and then move onto the next one. Then I cut all three stacked sandwiches into fourths and put on a serving platter with a jar of maple syrup. 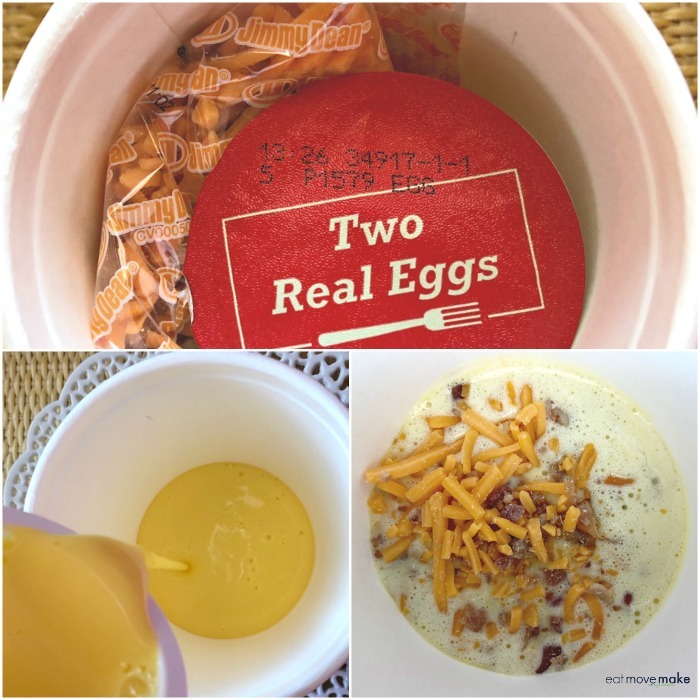 Jimmy Dean Simple Scrambles – Treat Yourself to a Better Breakfast in Minutes! This post is sponsored by The Hillshire Brands Company but the content and opinions expressed here are my own. How often can you say you treat yourself to a weekend-style breakfast on a weekday? I used to be right there with ya, but not anymore. Now I fuel up my morning with a delicious, satisfying and protein-rich breakfast in about a minute… any day of the week. 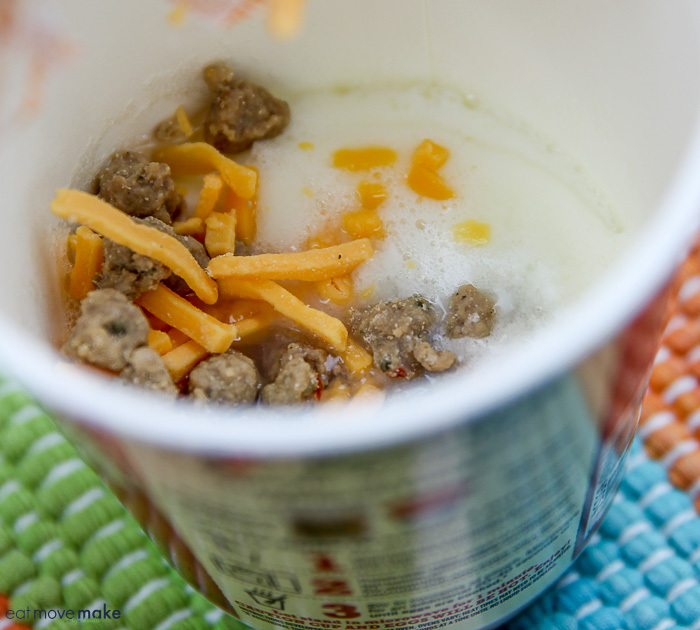 The secret is Jimmy Dean Simple Scrambles® breakfast cups – my go-to breakfast whether I’m home or on-the-go. 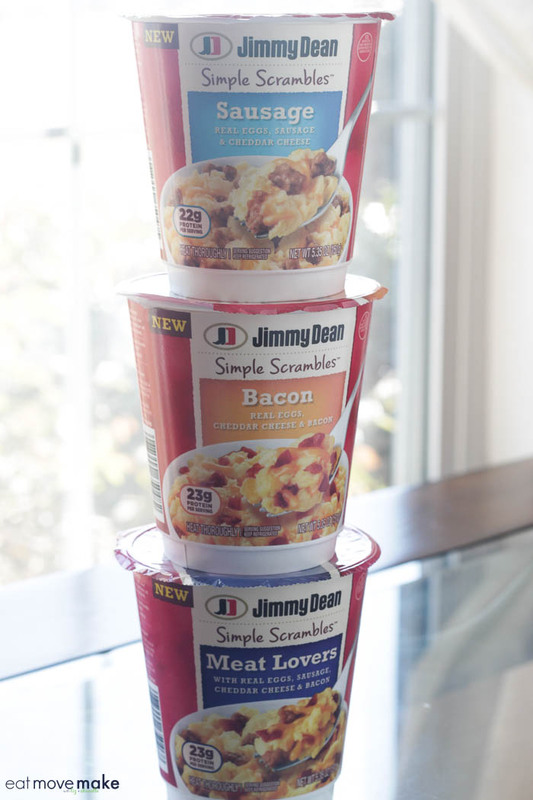 Jimmy Dean Simple Scrambles have been around for a year or so, but let me introduce you now if you’ve yet to try them. 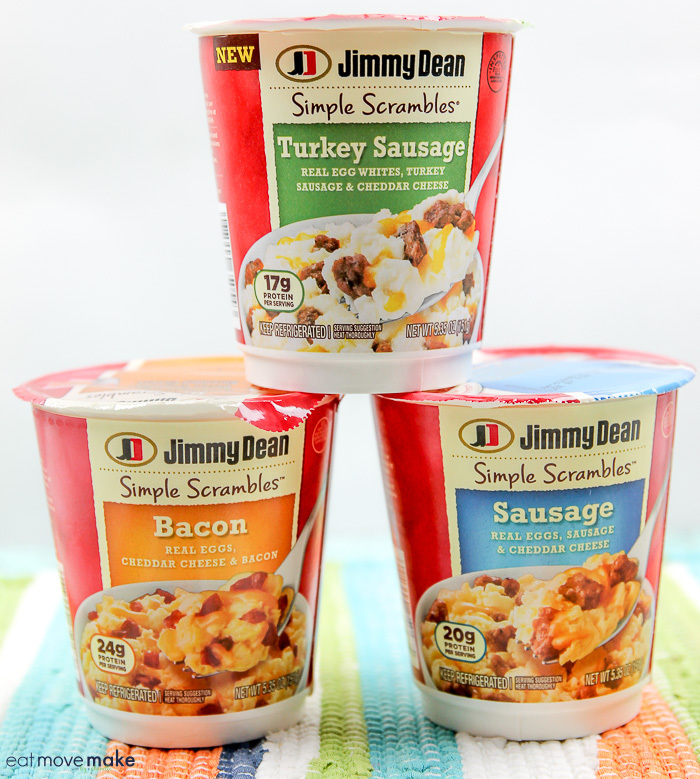 And I need to give a warm welcome to the newest Jimmy Dean Simple Scrambles varieties: Turkey Sausage Simple Scrambles and Three Cheese Simple Scrambles, both of which are made with egg whites. 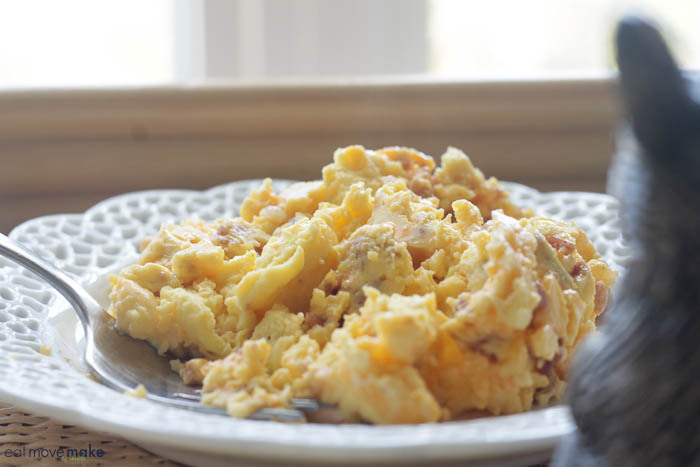 Jimmy Dean Simple Scrambles are made with real eggs and they truly taste like I spent time slaving away over the stove to make them. But, I didn’t. I wouldn’t. Why should I spend one minute longer than I need to in the kitchen first thing in the morning? There’s no point in doing that when I have the ultimate breakfast solution at hand. Y’all need to try them! 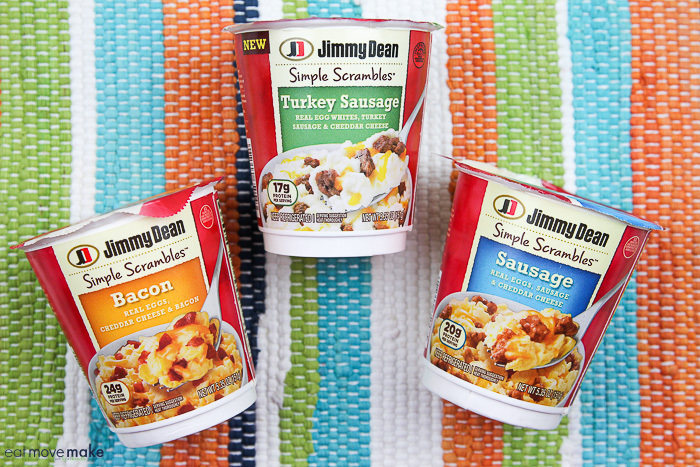 Look for Jimmy Dean Simple Scrambles in the refrigerated section of your local Walmart grocery store (by the bacon). 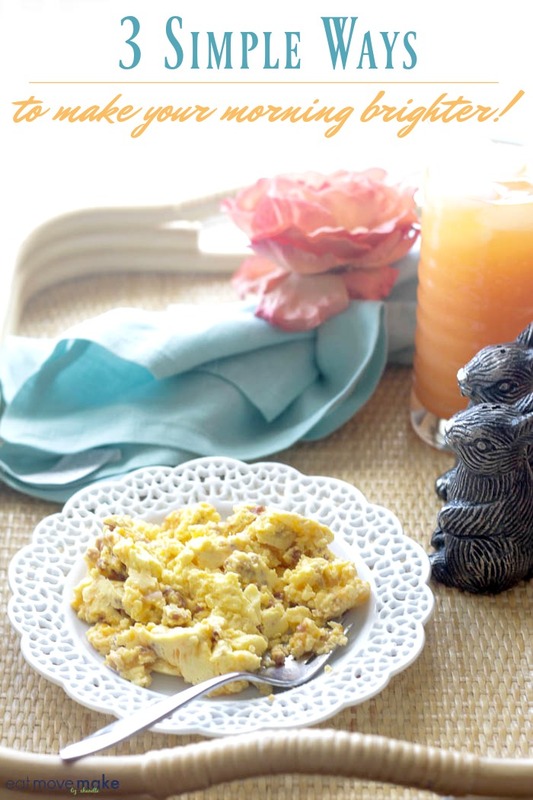 Oh, and did I mention that making your new favorite breakfast is as easy as could be? It’s SO easy. 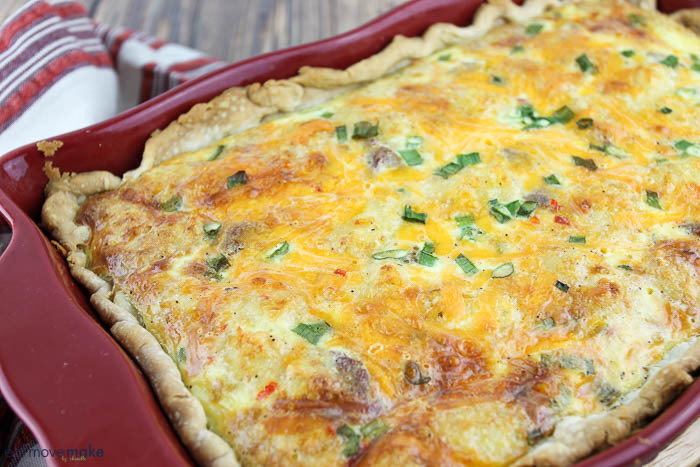 In about a minute, you’ll have a breakfast worthy of the weekend! 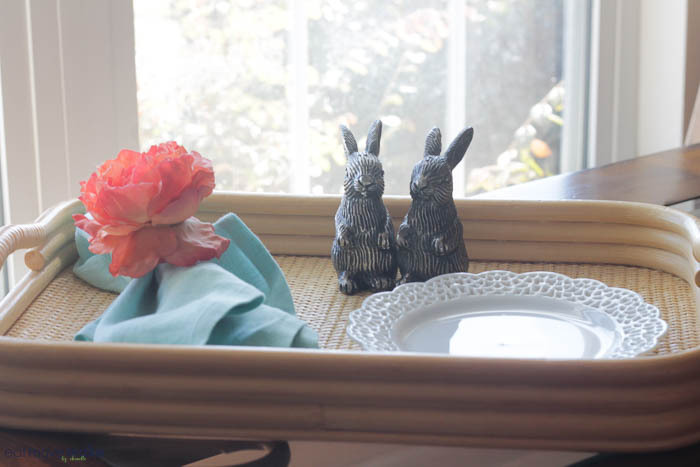 The fresh and delicious eggs are light, fluffy and extraordinarily yummy! 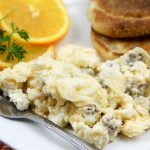 Jimmy Dean Simple Scrambles are a super convenient, wholesome breakfast option, and they’re prepared in just minutes any day of the week. 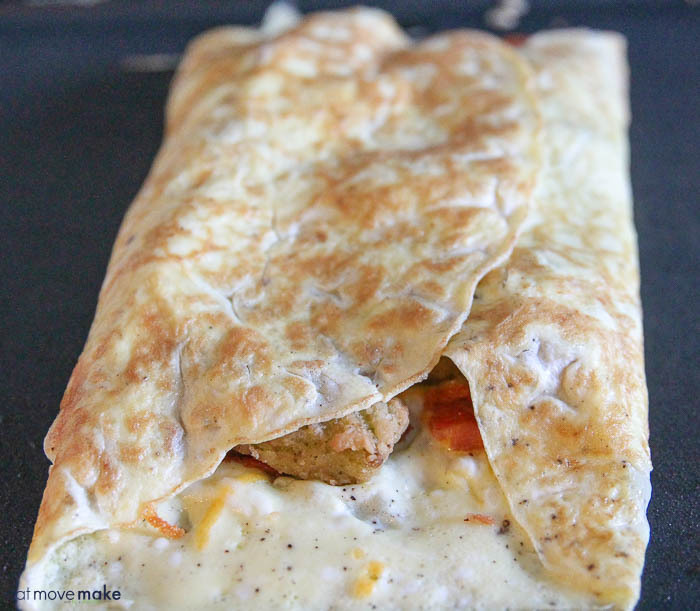 They also make a great on-the-go breakfast when you’re hungry but need to get out the door pronto. 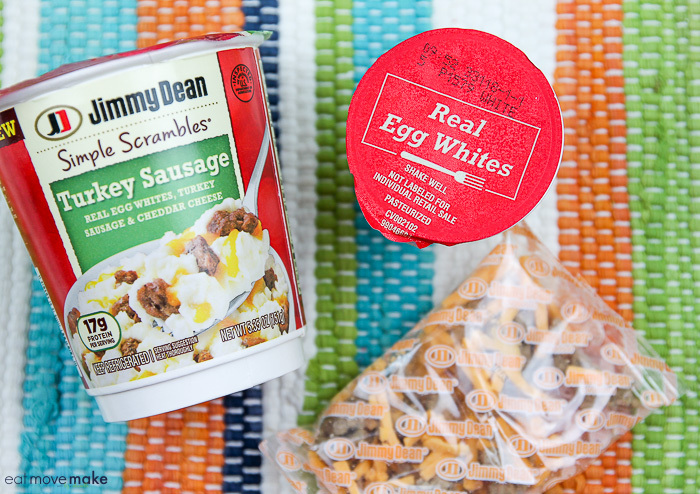 Treat yourself to Jimmy Dean Simple Scrambles! Remember to look for them near the bacon in the refrigerated section of Walmart. Breakfast will never be the same, and that’s a good thing! Enjoy! 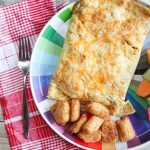 I was inspired to make this veggie tots omelette recipe after I saw the artwork on the Green Giant Veggie Tots packaging. It’s created by St. Jude patients! 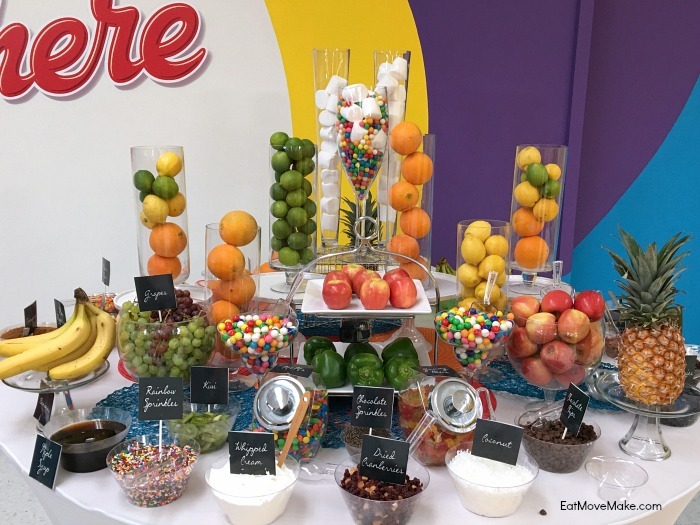 My friends at St. Jude Children’s Research Hospital® told me about it and I practically begged them to send me some, so I could make a recipe and share the news. 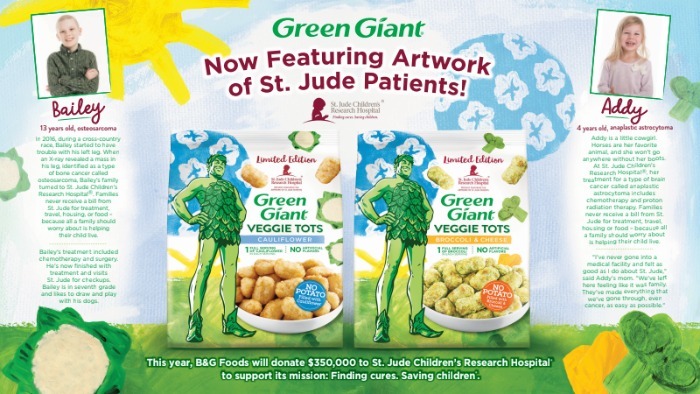 They’ve partnered with Green Giant to feature patient artwork on one million bags of limited edition Green Giant® Veggie Tots. In addition to featuring the artwork on packaging, B&G Foods (owner of Green Giant) donated $350,000 and their employees donated another $250,000 to the organization. As you probably know, St. Jude Children’s Research Hospital® works tirelessly to understand, treat and defeat childhood cancer and other life-threatening diseases, and having visited the hospital myself, I’ve seen firsthand what a difference they make every single day for children and their families. 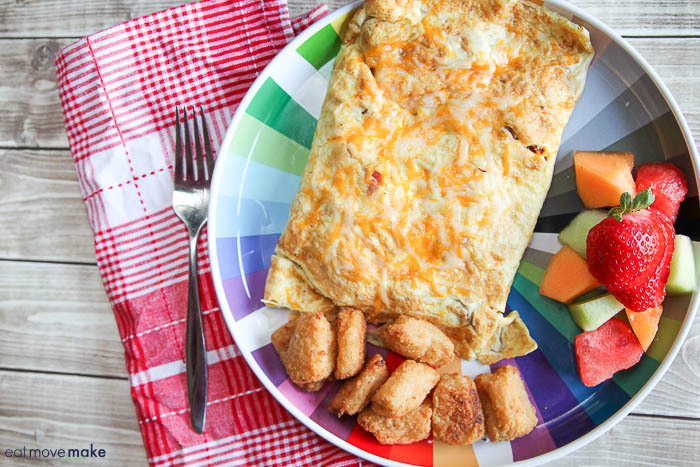 So that’s how this veggie tots omelette recipe came to be. And it’s oh, so yummy! I’ve been using Green Giant veggie alternatives for ingredients a lot this year, and I’m loving it! 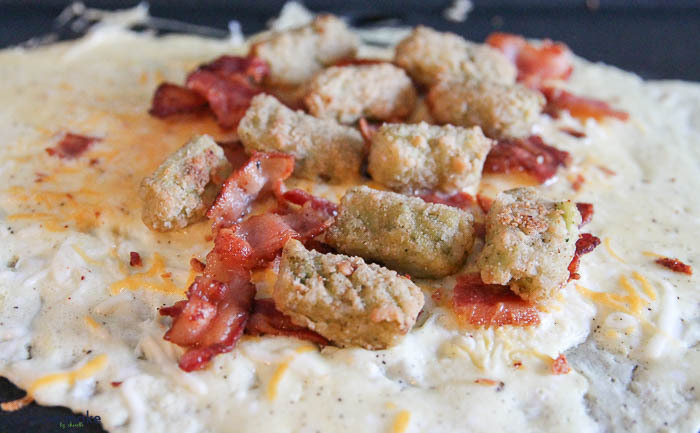 For this recipe, I used the broccoli and cheese veggie tots inside the omelette and served cauliflower tots alongside it. 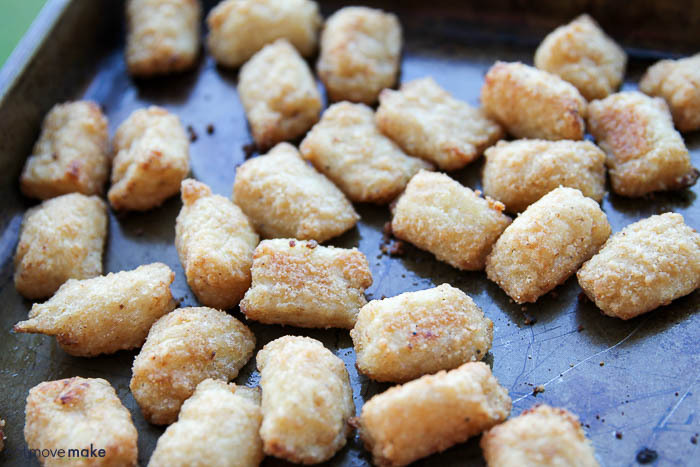 They make a great switcheroo from traditional tater tots! I baked the veggie tots on a cookie sheet following the package directions. They do crisp on the outside, but they’re moister than tater tots and will have a softer texture when you bite into them. I made three-egg omelettes filled with veggie tots and a little cheese and bacon. They turned out great! It’s a delicious way to start the day! 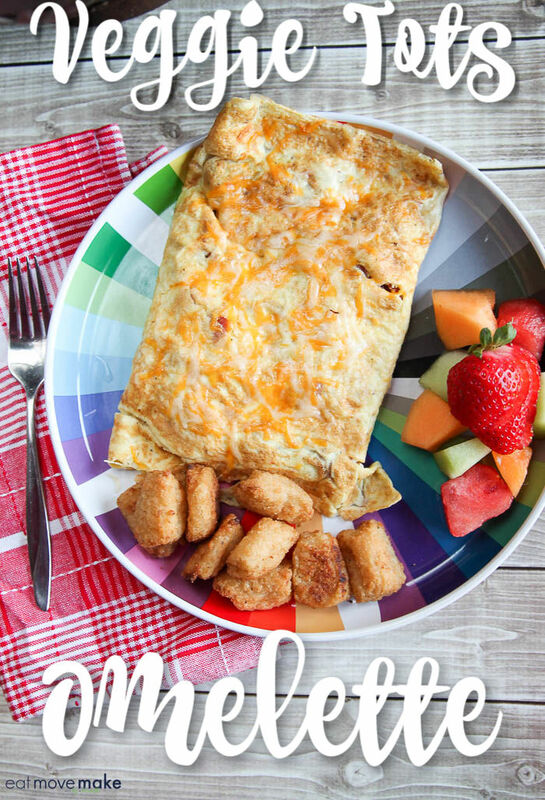 Pin the Veggie Tots Omelette for a healthy and easy holiday breakfast/brunch idea! 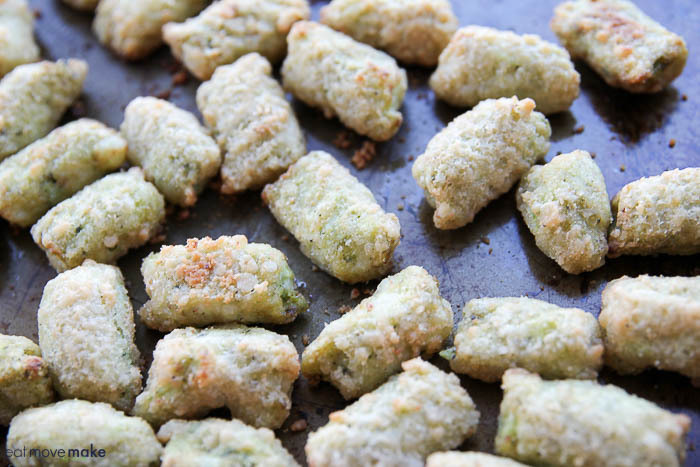 Cook Green Giant Broccoli Veggie Tots according to package directions. In small bowl, beat eggs, water, salt and pepper until blended. Heat butter on electric skillet over medium-high heat until hot. Pour in egg mixture in rectangular shape. Edges will set immediately. 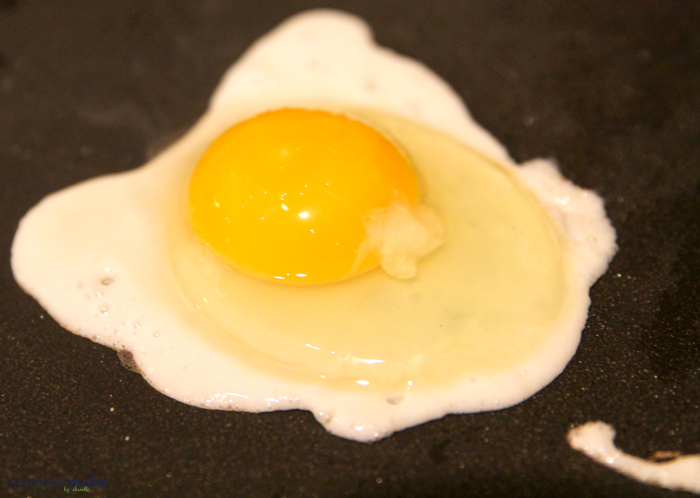 Using a spatula, pull the eggs in from all four sides toward the center, allowing the liquid eggs to flow underneath the set areas. When top surface of eggs is thickened and no visible liquid egg remains, sprinkle bacon, cheese and veggie tots in center section. Fold side sections over top, and flip to invert and finish cooking. Use a spatula to remove from skillet and place on plate. Serve immediately. 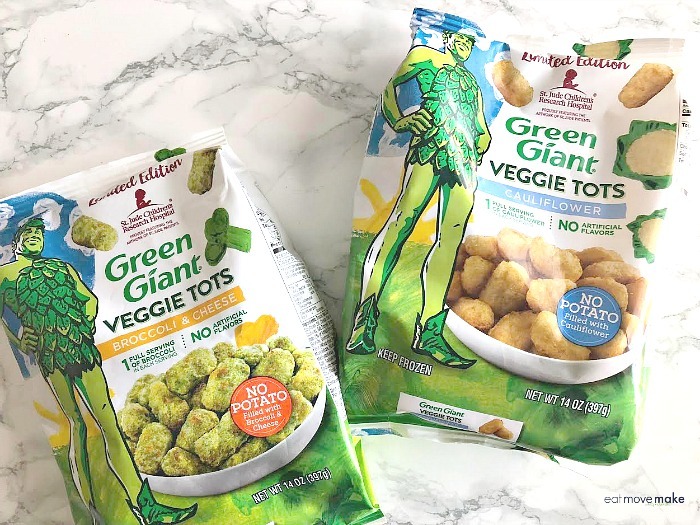 Look for Green Giant Veggie Tots in the freezer section of your grocery store now! 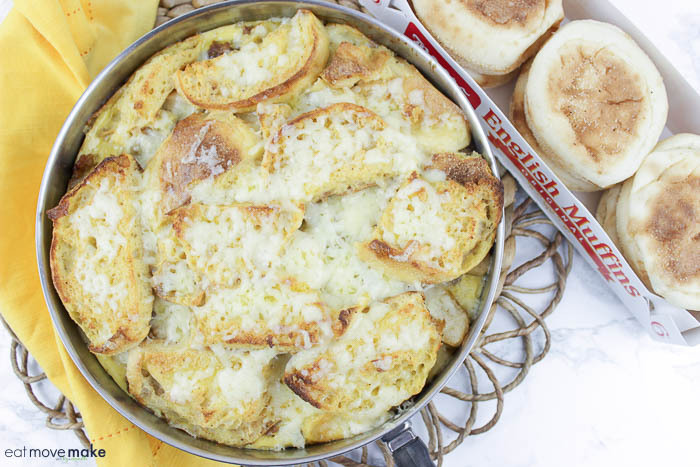 This sausage, apple and cheddar skillet recipe post is sponsored by Bays English Muffins. All views expressed are my own. 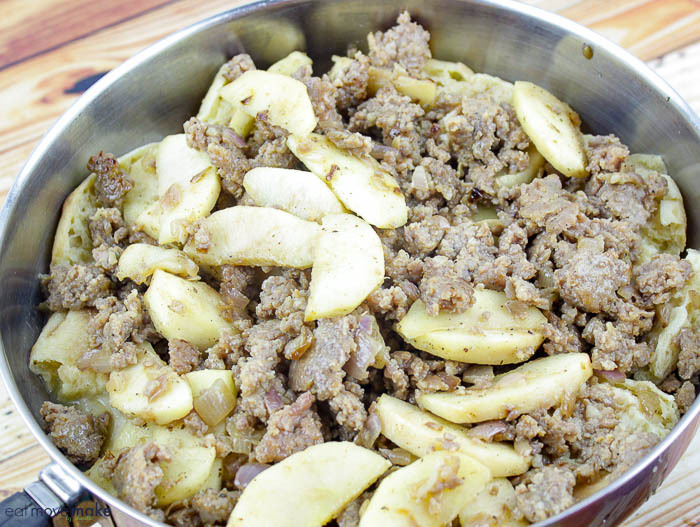 Oh, how I crave this sausage, apple and cheddar skillet! 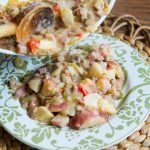 It’s impossibly delicious, and I love how it combines savory ingredients (I’m a huge savory fan!) with just a hint of sweetness from the apples. So stinkin’ good, y’all. Loooook at this mouthwatering masterpiece. You know what the best part about making this sausage, apple and cheddar skillet is? 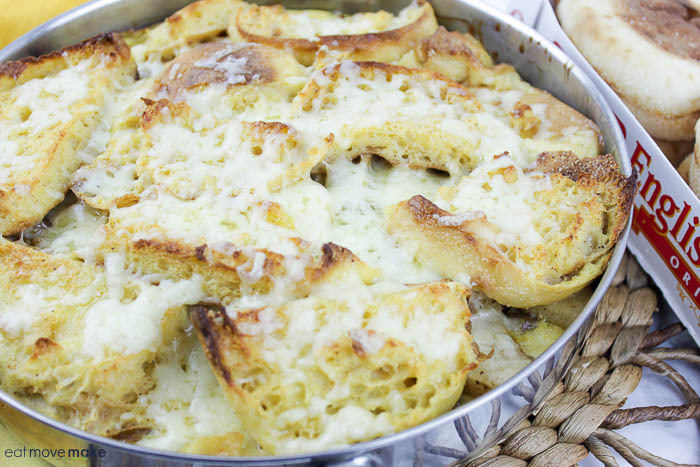 There’s no need for finding day-old stale bread and chopping it all up into cubes. Not anymore, folks. I discovered a game-changing shortcut with Bays English Muffins. English muffins can be used for much more than just breakfast at home, and this recipe is a classic example of that. 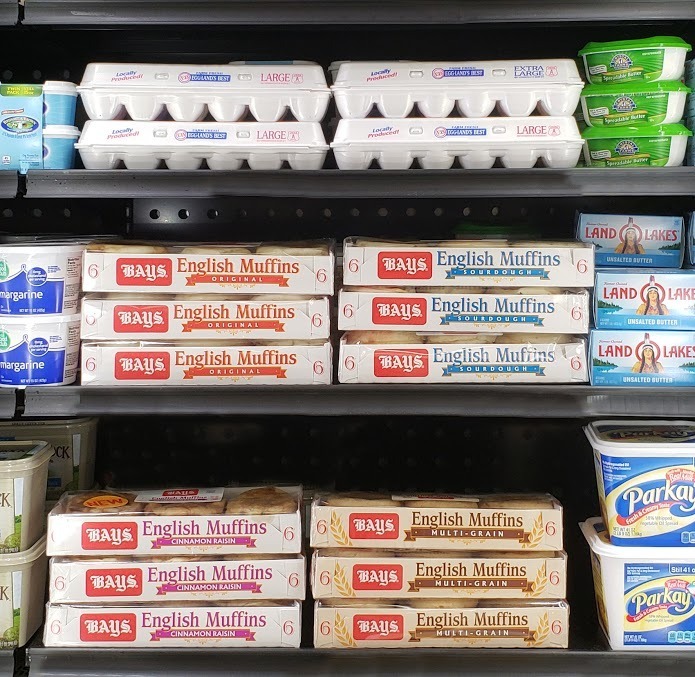 Bays English Muffins are delicious at any time of day – 24 hours of yumminess comin’ at you from the dairy case (next to the eggs and butter) where they’re carefully chilled for freshness. I’m tellin’ ya, Bays English Muffins are the key to this recipe’s success. So about the recipe… it’s perfect for breakfast or brunch of course, but it works equally well as a hearty breakfast-for-dinner. 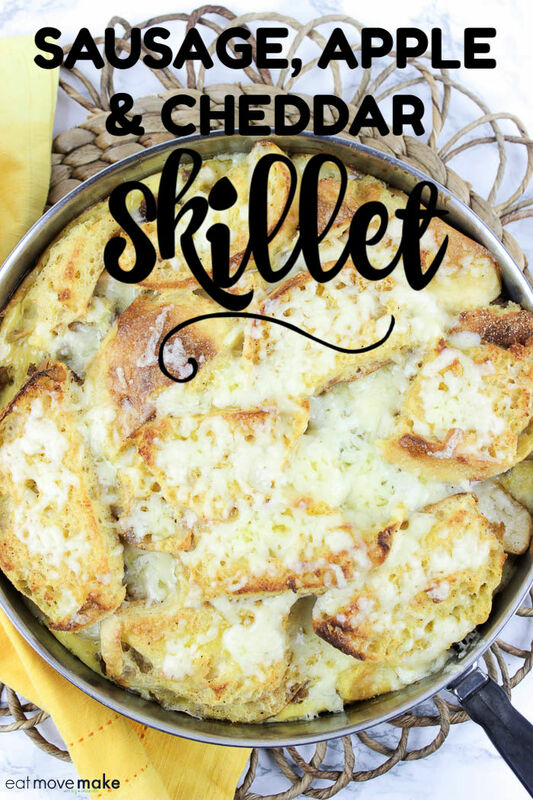 If you know me, you know I love breakfast for dinner, and that’s exactly how I serve this skillet to my family! Grab a pack in the grocery store. 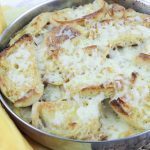 Bays elevates any meal occasion, and I highly suggest you start elevating those meals by making this one! Since Bays are precut, they can be pulled apart with your fingers, so it makes getting them ready for this recipe even easier. Just cut them in half and pull apart before soaking them in the magical egg mixture. By the way, do you know how hard it was to resist eating one of the soft and fresh English muffins when I was cutting them? While the English muffins were in the fridge soaking up the goodness, I cooked up some sausage, onions, and apples with just the right seasoning. Then I layered half the English muffins with the sausage and apple mixture, topped that with cheese and the rest of the English muffins and egg mixture. It all went into the oven to bake, and got a final cheese sprinkle in the last five minutes of baking. 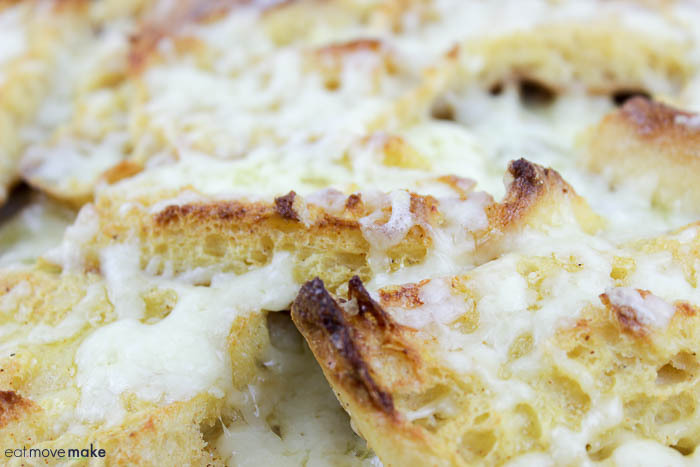 The result: ooey, gooey, hot and melted perfection. There’s so much yum in every bite, you won’t know what to do with yourself. Beat the eggs, milk, paprika, nutmeg and salt together in a large bowl until well blended. Add the muffins and stir gently to coat. Cover the bowl with plastic wrap and let stand at room temperature for 1 hour. Alternatively, refrigerate the mixture for several hours or overnight. and mix well. (This step may be done and refrigerated overnight if desired). 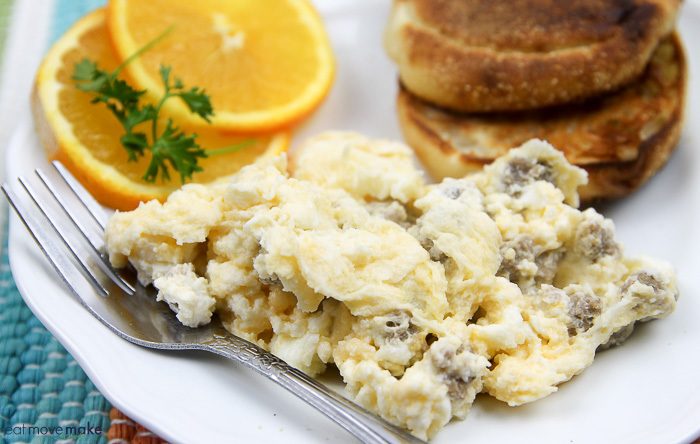 remaining muffin pieces and pour the remaining egg mixture into the skillet. 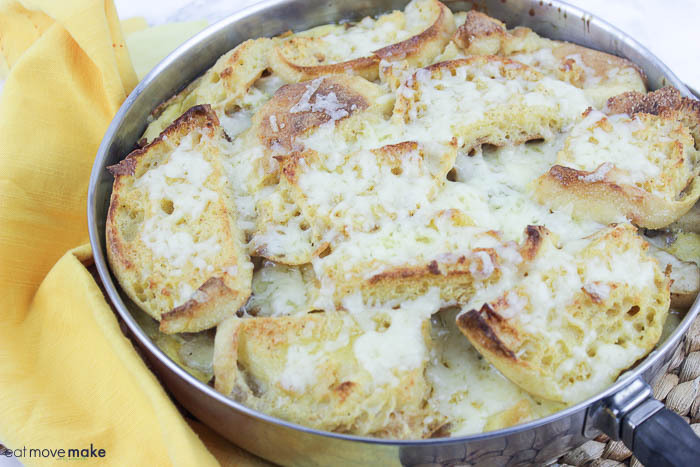 top with the remaining 3/4 cup cheese and bake until melted, about 5 minutes longer. Remove from the oven and let cool 5 to 10 minutes before cutting into wedges. 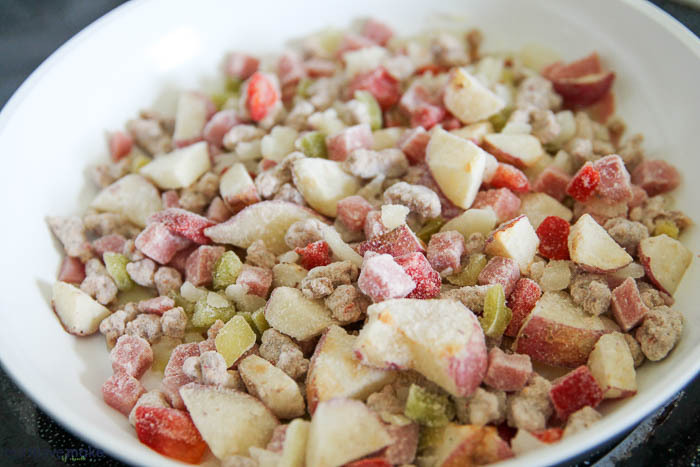 Seasonal Alternatives: For the Spring substitute 8 ounces of diced cooked ham for the sausage, 12 ounces of steamed or roasted asparagus (cut into 1-inch pieces) for the apple and 2 cups shredded Swiss or Gruyere cheese for the cheddar. For the Summer substitute 4 ounces of chopped smoked salmon for the sausage and 2 cups sautéed mixed summer vegetables such as zucchini, yellow squash, bell pepper and grape tomatoes. Sprinkle the filling with 1 1/2 cups crumbled feta cheese and bake without any additional cheese on top. 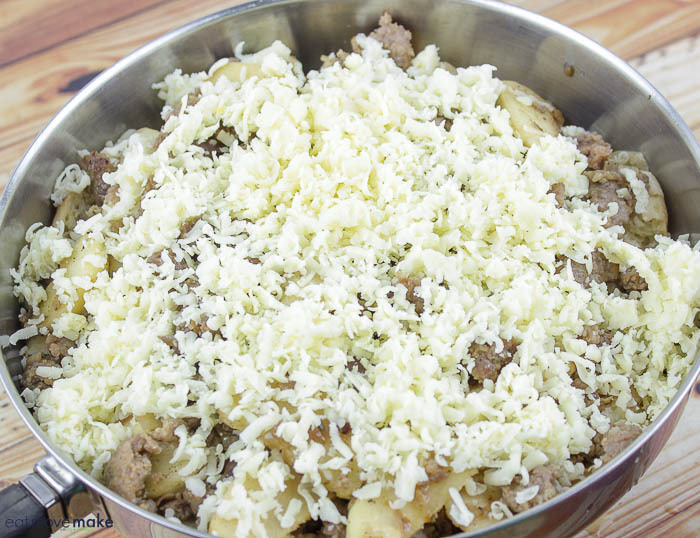 Pin the sausage, apple and cheddar skillet recipe for later! 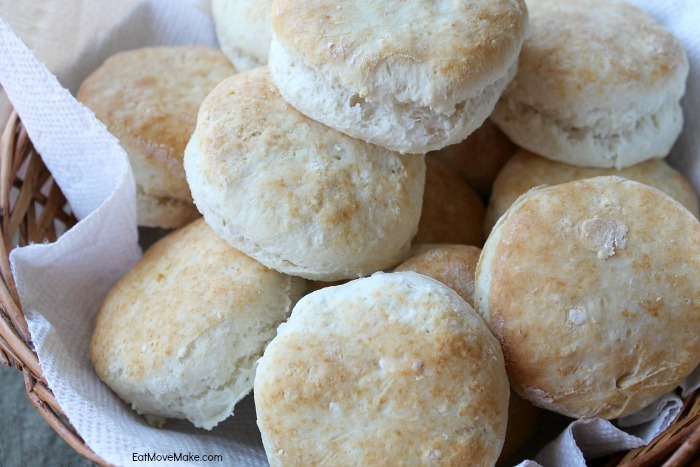 Visit Bays.com for more creative ways to use English muffins for appetizers, breakfast and dinner! And be sure to connect with Bays on Facebook at Facebook.com/baysenglishmuffins for even more recipes and fun! This is a sponsored post written by me on behalf of Omaha Steaks Butcher’s Breakfast Skillets. All opinions are my own. As soon as you wake the kids up on school day mornings, it feels like you’re in an escape room with a timer madly counting down the minutes, and there are all kinds of puzzles to be solved before you can leave. It’s madness! Some mornings it’s all you can do to get the kids out the door at all. If they’ve managed to eat breakfast, you’re winning at life. While I can’t help you solve your morning puzzles, I do have an easy route to a great breakfast. Try Omaha Steaks Butcher’s Breakfast Skillets – hearty and delicious meals that go from freezer to table in just 15 minutes or less. My favorite is the Chorizo & Sweet Potato Hash Skillet. 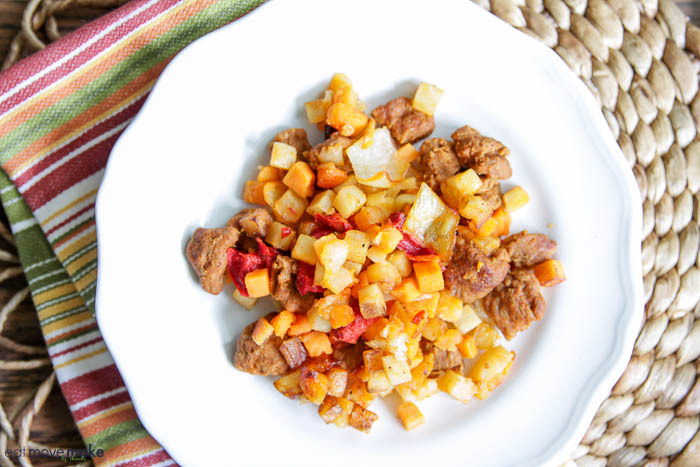 The sausage is slightly spicy and the tender sweet potatoes, red peppers and onions make the perfect skillet partners. 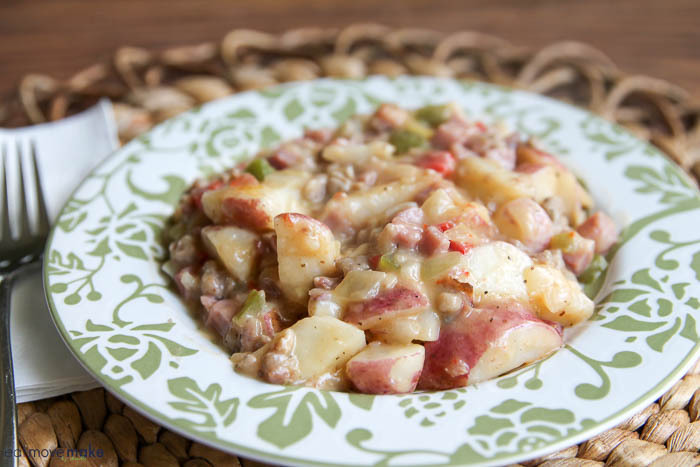 My son’s favorite breakfast is the Meat Lovers with its trio of ham, bacon and sausage along with potatoes, peppers and onions in a really tasty gravy. But he also really likes the Ranchero Steak and Beans. 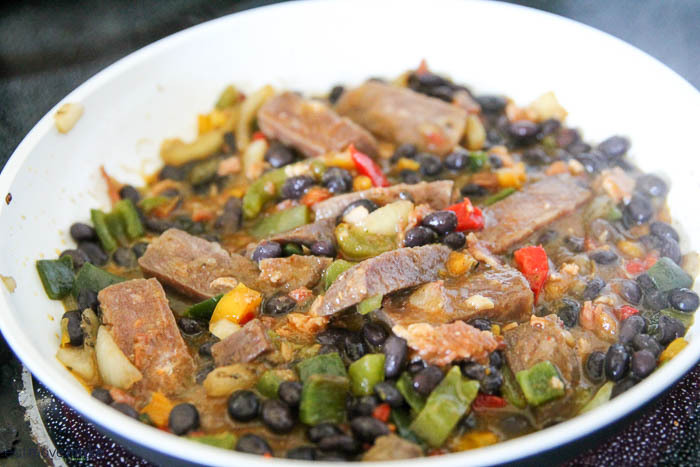 It has generous-sized pieces of steak with bacon, chilies, tomatoes, veggies and delicious spices. … to table in 15 minutes. And that’s the way to start a morning off right! 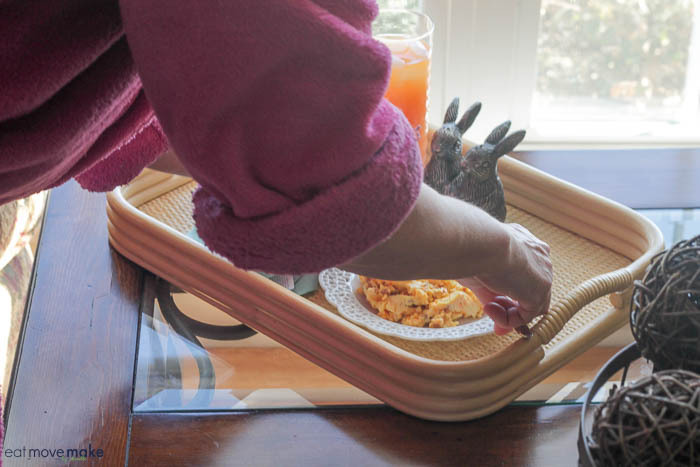 Since they’re so quick and easy, you can ensure the kids leave the house every morning with full bellies so they’re ready for a full day of learning. 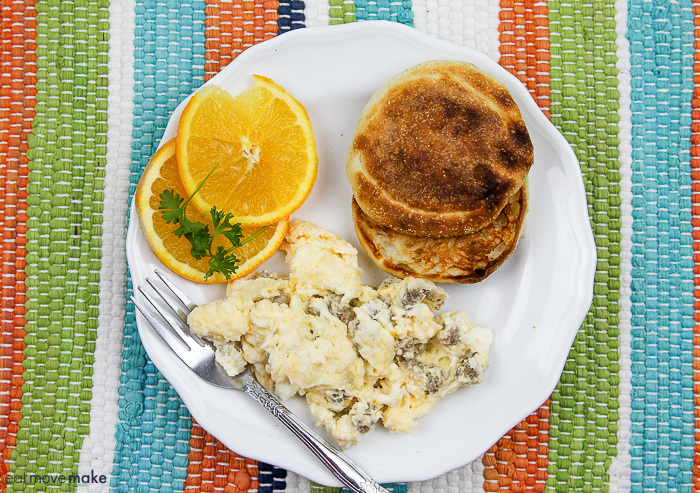 Visit OmahaSteaks.com and start making breakfast the easy way! 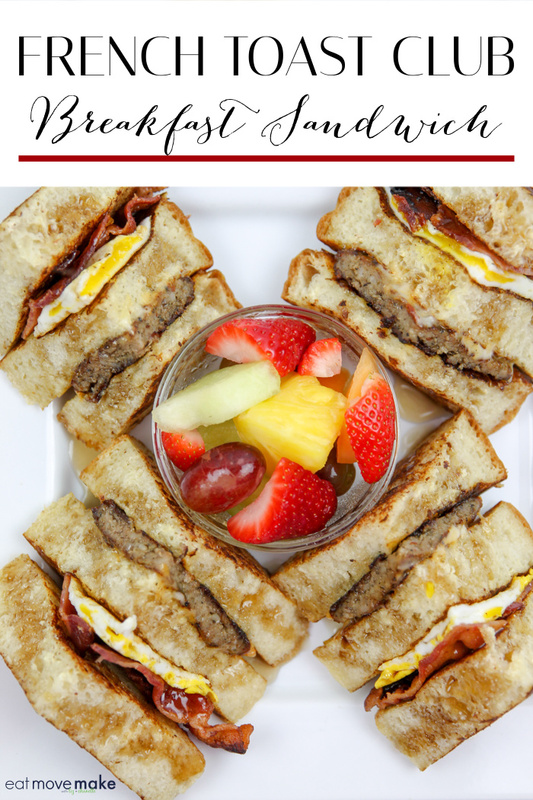 Pin the Omaha Steaks Butcher’s Breakfast Skillets for breakfast inspo! 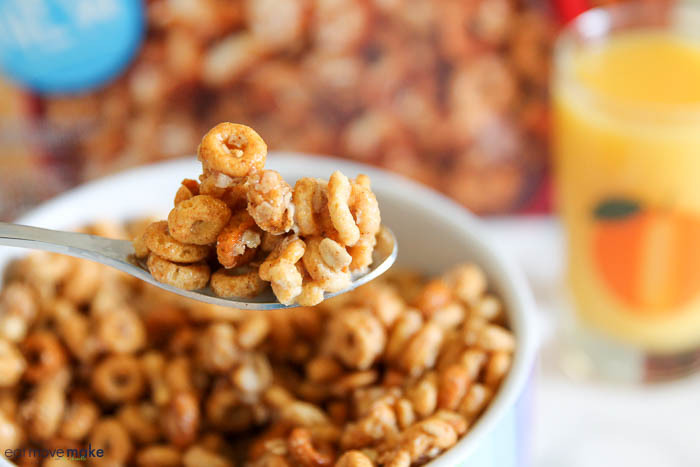 Cheerios Oat Crunch – New for Breakfast! This post has been sponsored by SheSpeaks, Inc., General Mills and Cheerios. All thoughts and opinions are my own. My mom bought what seemed like every variety of cereal (there were six of us kids) and when there was something new… she’d always get it for us to try. We had a lazy susan cupboard and it was so exciting to spin it around and choose the next box of cereal to open. Since I was a morning person back then, I lucked out with picking duty a lot! The reason I’m telling you all this is because I still get geeked when I spot new cereals. I can hardly wait to open the box, rip open the plastic bag and reach in for a handful. 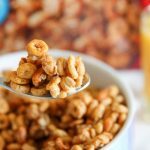 This week I discovered NEW Cheerios Oat Crunch at Walmart, and one of the biggest reasons I like shopping at Walmart is because they tend to get new products first (or sometimes, exclusively). Guys, get yourself a box! Oh my goodness, it’s good! I usually eat cereal for lunch or dinner, but when I got that first handful and shoved it in my mouth fist first (like a baby), I loved it so much that I poured myself a bowl for breakfast. 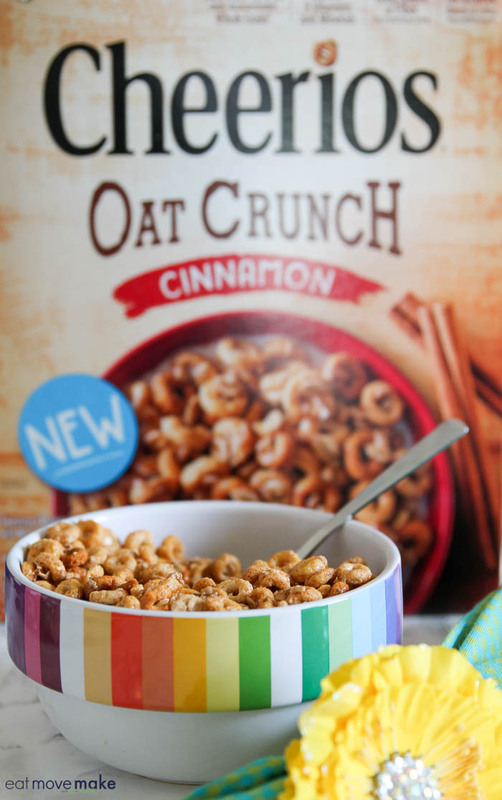 It’s made with Multi Grain Cheerios and then topped with whole grain oats and real cinnamon. 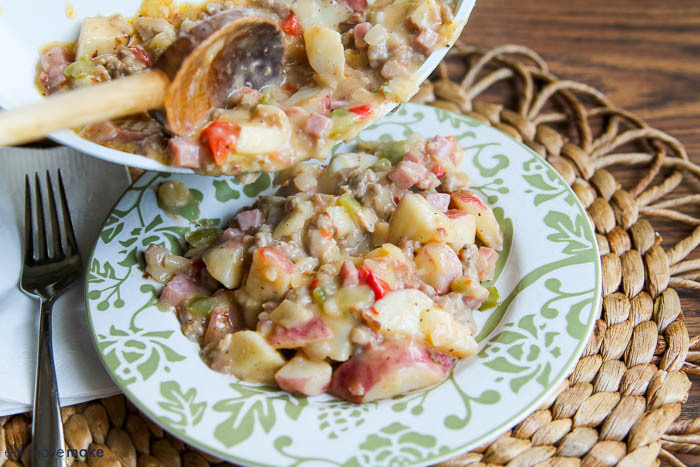 It’s nutritious, hearty and simply delicious! There’s sort of a cinnamon- toast-y granola thing happening along with a satisfying amount of sweetness. And there’s a great crunch … oh, how I love a good crunch! You can see the texture and crunch in every spoonful. Notice the whole oats on top of the O’s? You probably don’t notice much milk in my bowl, do you? That’s because I add the smallest amount of milk possible to my cereal so I never lose the crunch. EVER. I’m telling ya… crunching is my happy place. Also my happy place — my bed. 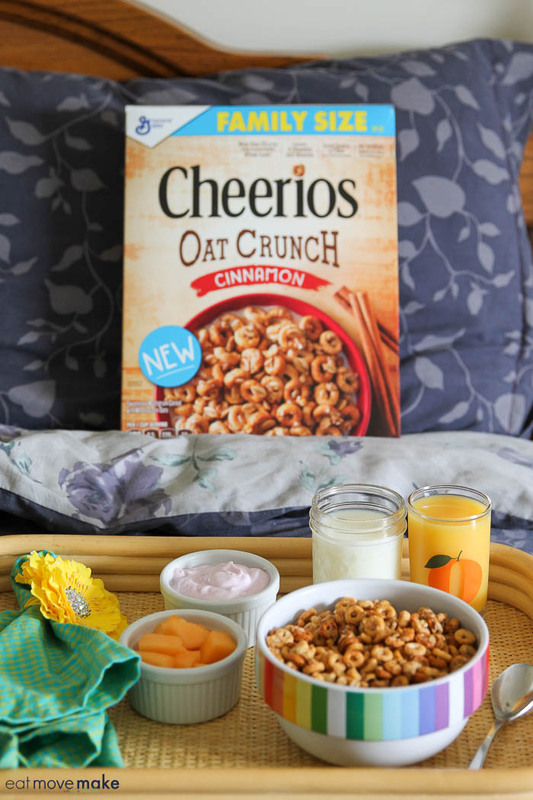 Here’s the math on that: crunching Cheerios Oat Crunch for breakfast in bed. Because the nitty gritty details of nutrition are vital to me, I’m gonna break it down for you too. 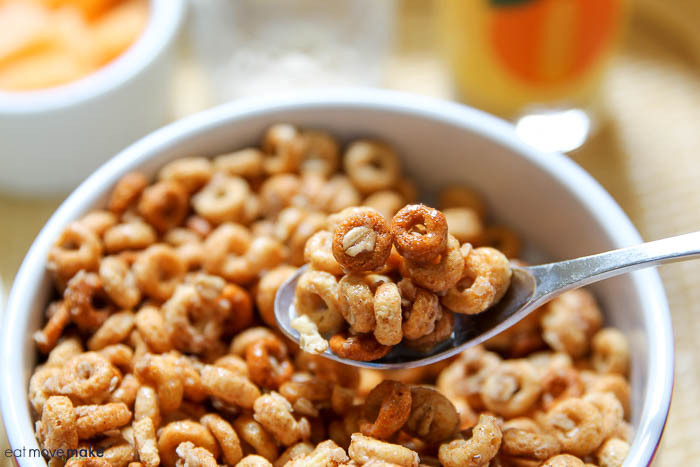 Cheerios Oat Crunch serves as a good source of fiber and contains 9 vitamins and minerals plus more than 1/2 the recommended daily whole grain per serving *(*48 grams recommended daily). There are also no artificial flavors, no artificial colors and no colors from artificial sources. 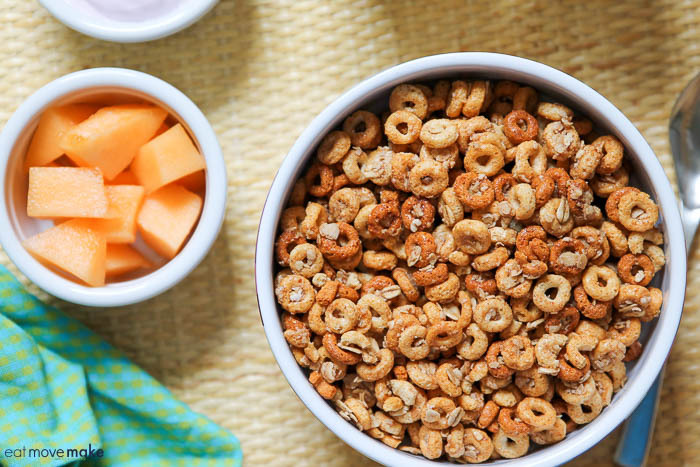 Cheerios Oat Crunch is legit. 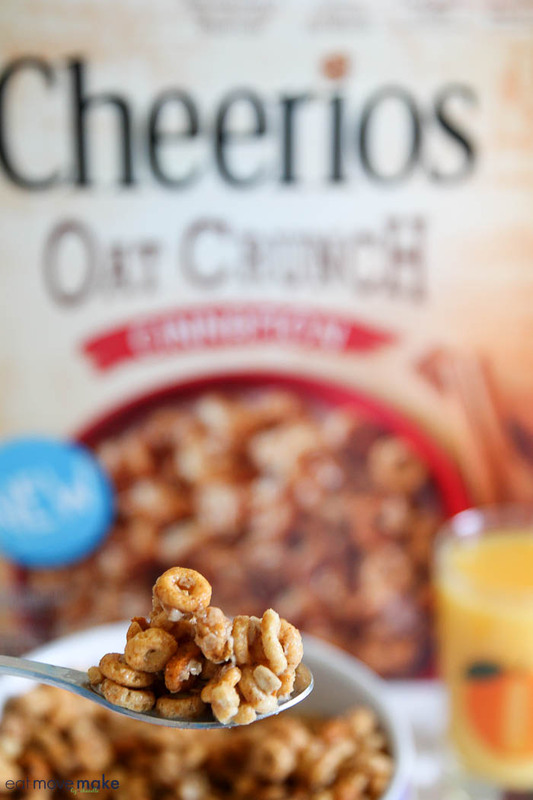 Head to Walmart as quick as you can and get a box of Cheerios Oat Crunch! When I was a child, I remember visiting family friends and waking up to the smell of something delicious baking in the oven, and when we wandered out to the kitchen, there would be an amazing breakfast waiting for us. It made me feel so loved! I want people to feel warmly welcomed and loved when they visit me too, and that’s the inspiration behind this meal. 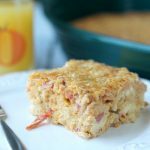 A hot and hearty breakfast is the perfect way to start a morning and this corned beef breakfast bake recipe will satisfy bellies and put happy smiles of satisfaction on everyone’s faces as they begin the day. 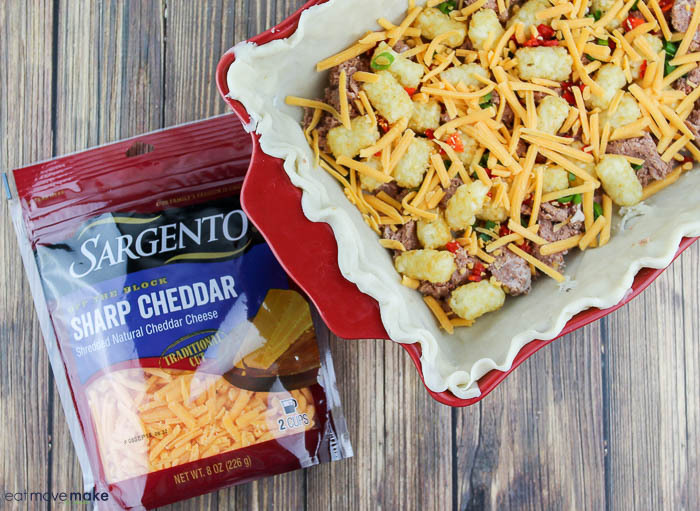 I make it with feel-good ingredients like Sargento® Shredded Sharp Cheddar Cheese, eggs, corned beef and tater tots, and I’m specifying Sargento® cheese because it matters. Sargento® is always shredded fresh from blocks of real, natural cheese and the flavor and quality is unsurpassed. Get a fresh start with Sargento®, y’all. You will taste the difference. 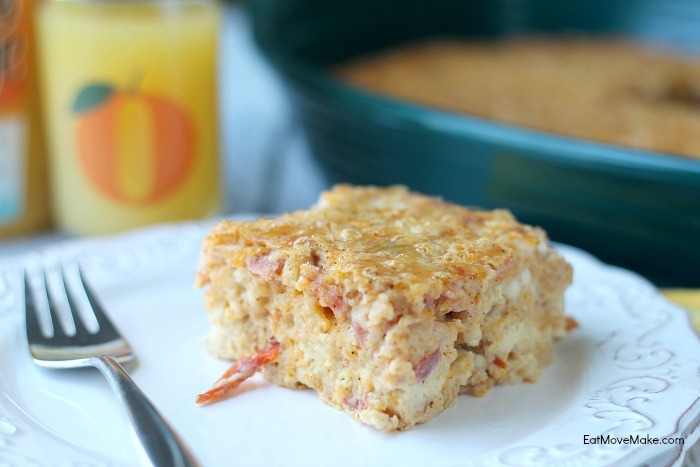 So here’s how to make this scrumptious corned beef breakfast bake! 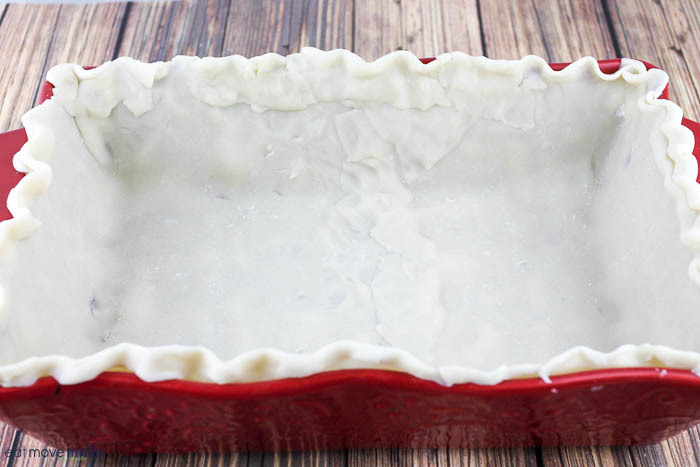 You’ll use two refrigerated pie crusts for the shell (one for each half), so form them into the shape of your greased baking dish. Seams showing won’t matter because you’ll be covering all that up with all your ingredients. 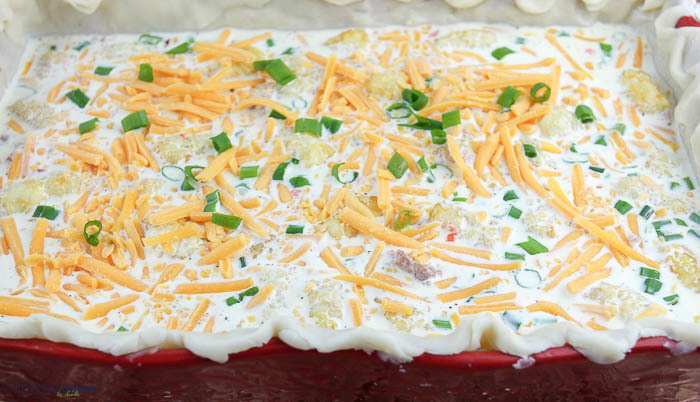 Next, layer the corned beef, tater tots, green onions, peppers and Sargento® cheese. Then, repeat those layers a second time. 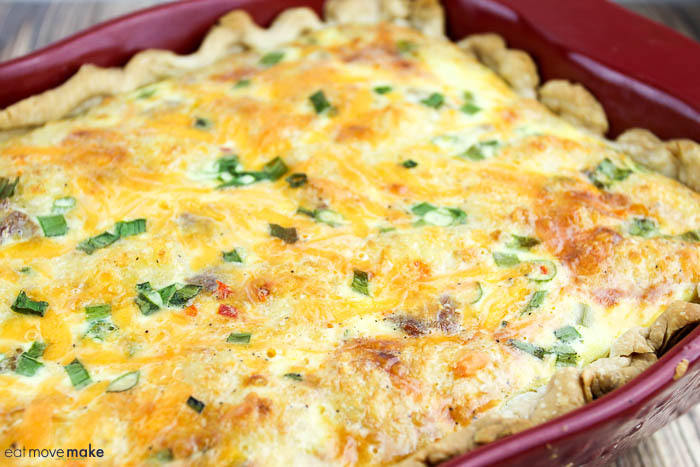 When you’re ready to bake, add the egg and cream mixture, then sprinkle on more cheese and green onions. 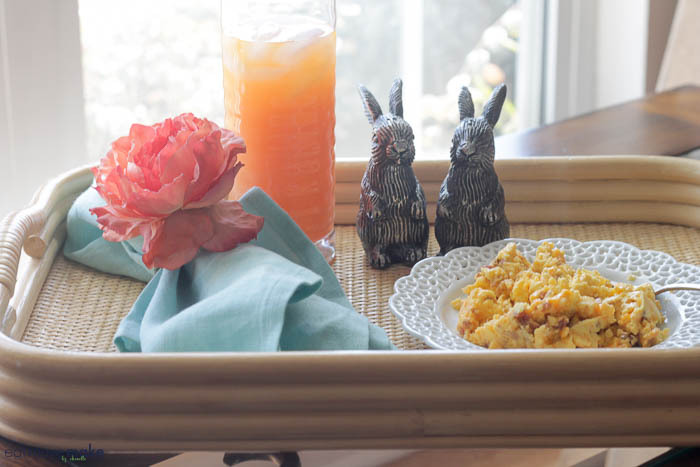 Can you believe how simple it is to whip up a delicious breakfast with Sargento® cheese and eggs? It’s the perfect solution to easy and enjoyable breakfast prep, even when you’re short on time. Now pop the dish in the oven for an hour and BAM! 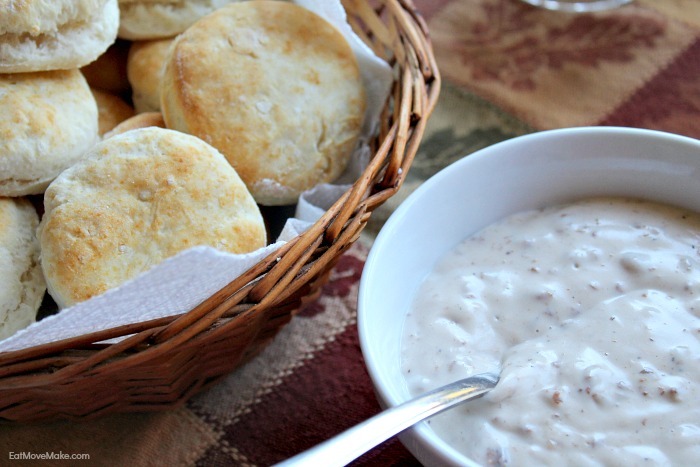 You’ve got yourself one heck of a great tasting breakfast. When it comes out of the oven, let it rest for a while so the filling has a chance to settle a bit. Then cut it into slices and serve. It’s absolutely delicious! 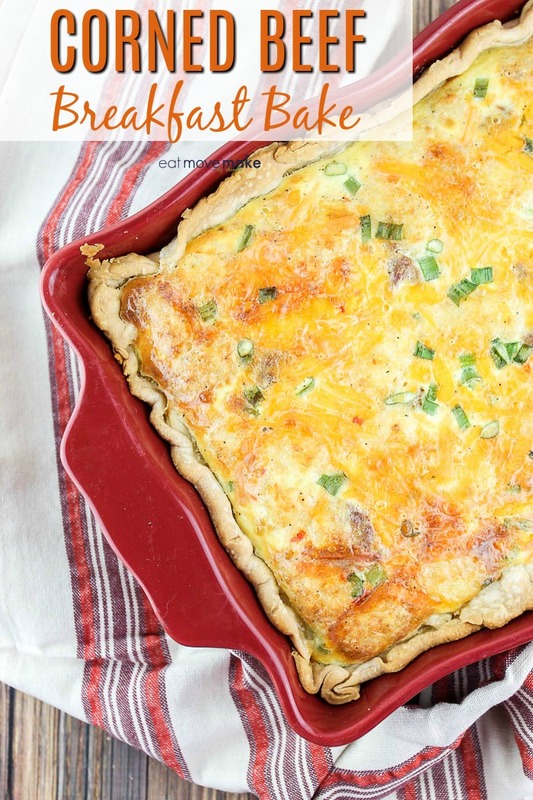 It doesn’t take long to whip this up in the morning and have it ready to go in the oven, but if you’re going to have a busy morning, you can do everything except adding the filling. Pour that into the baking dish in the morning and then bake it in the pre-heated oven. Preheat oven to 375 degrees F. Spray 9 x 13-inch pan with baking spray. Form pie dough to fit into baking dish. Flute edges if desired. Layer half the corned beef, 1 cup tater tots, a third of the green onions, half the peppers and half the cheese. Repeat the layers. In large bowl, whisk together eggs, cream and black pepper until fully incorporated. Pour over ingredients in baking dish. Top with remaining 1 cup cheese and final third of green onions. Bake for 1 hour. Let rest before cutting. 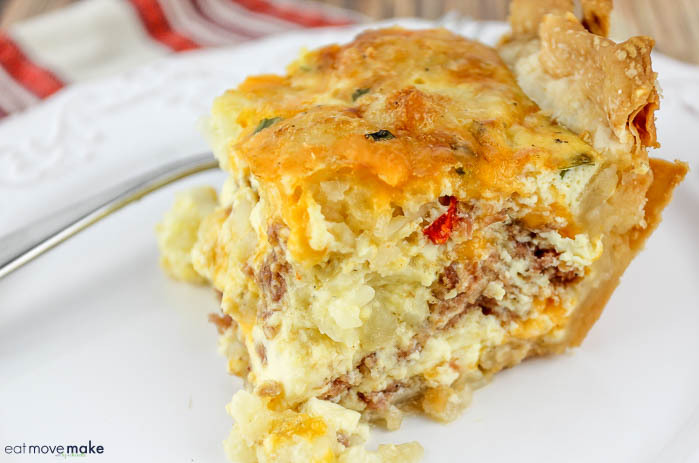 Ready to try your hand at making this delicious corned beef breakfast bake with Sargento® cheese and eggs? Grab this coupon and get a FREE carton of one-dozen grade-A large eggs when you purchase (2) Sargento shreds at Harris Teeter from March 28, 2018-April 10, 2018. 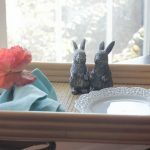 I’m sharing these simple ways to make your morning brighter because weekday mornings can be so hectic and stressful! 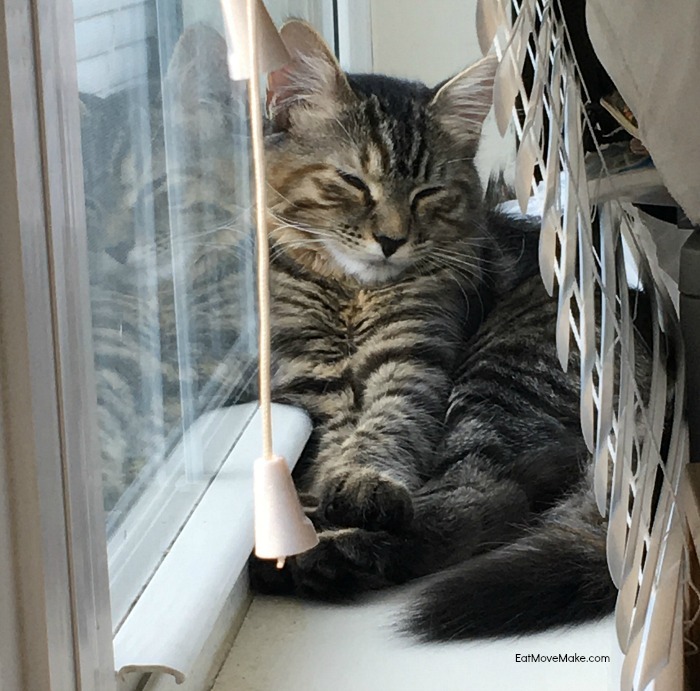 When Monday rolls around, I try to ease myself gently into the weekday work routine and if I allow myself a special daybreak moment, it always makes my morning (and entire day) brighter. 1. Sit by a window. Nature is the perfect elixir to stress, so give yourself a few minutes to gaze out the window and enjoy the new day’s tranquility. Watch the sun slowly rise in the sky and be entertained with the early morning bird songs. Nature is food for the soul. I learned this lesson from my cat. 2. Set the table for yourself. 3. 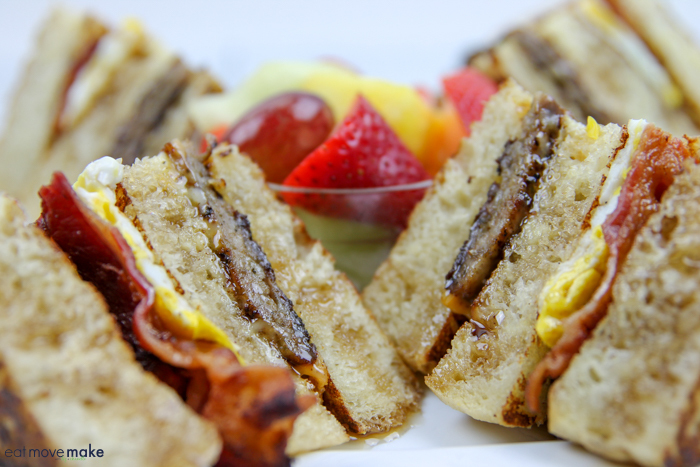 Treat yourself to the taste of a weekend-style breakfast on a weekday. Don’t panic… I know weekdays are hectic and you don’t have the time nor desire to spend more than a few minutes preparing breakfast. I get that, and I’m right there with you. Shoot, even when I do have the time, I rarely like to put much effort into anything at the break of dawn. 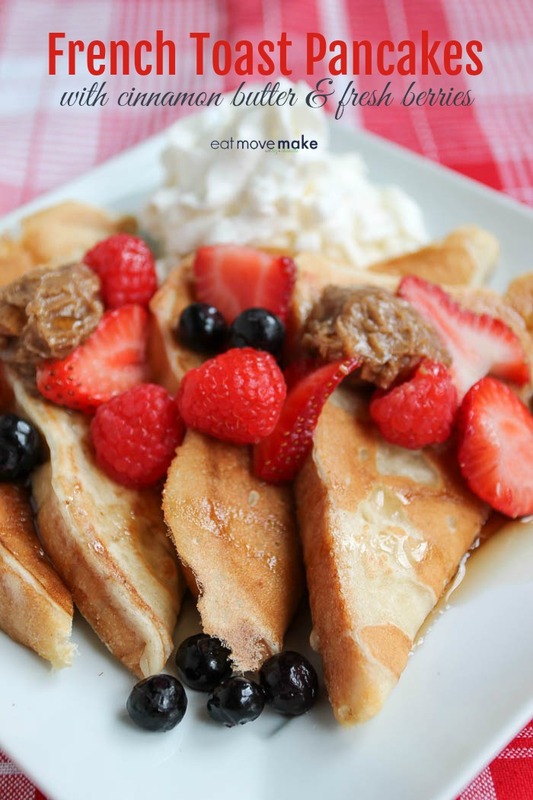 But what if you could have a delicious and satisfying protein-rich breakfast in seconds? I’m talking about two real eggs, cheese, sausage and bacon. Stat. Believe me, I was skeptical at first. I mean… bacon, eggs and sausage ready in a minute? How good could that really be? 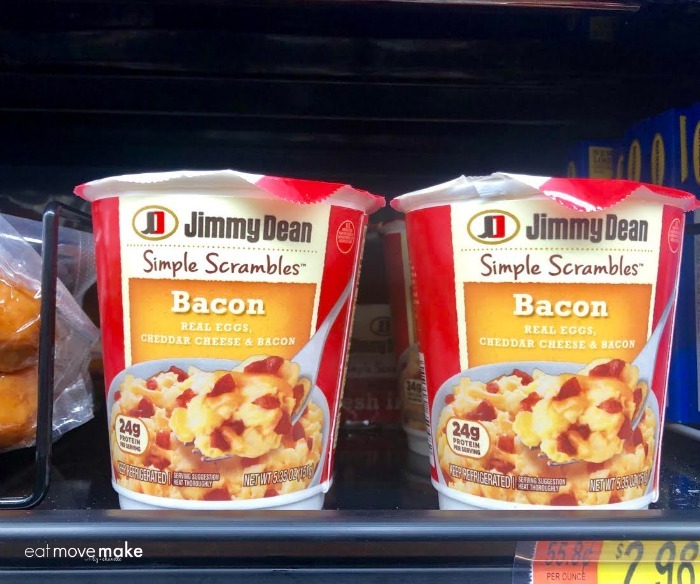 Well, Jimmy Dean Simple Scrambles® are fantastic, and they truly taste like you spent time slaving away over the stove to make them. It’s the ultimate breakfast solution. 1. Shake the egg container thoroughly. Open and pour into cup and microwave for 30 seconds. 2. Add meat and cheese package contents; mix in. 3. Microwave 30-40 seconds. Easy! There’s no clean-up needed, and you can probably tell from the photos that the eggs are really light and fluffy and the ingredients are high-quality. 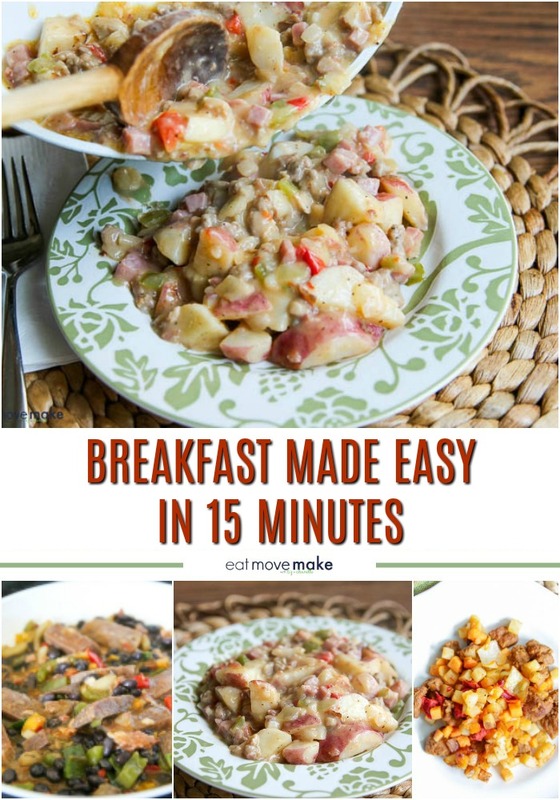 It’s super convenient, wholesome and makes a perfect on-the-go breakfast, although I encourage you to treat yourself to a breakfast morning moment whenever you can. 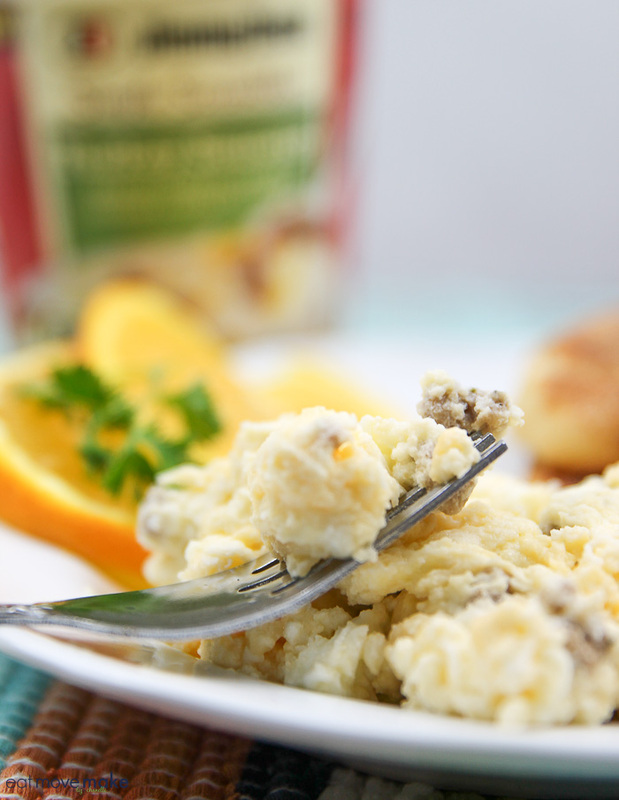 Look for Jimmy Dean Simple Scrambles® at Walmart in the refrigerated aisle, and enjoy a quick and delicious weekend-style breakfast any day of the week! When you’re shopping for your Thanksgiving must haves at Family Dollar this week, be sure to pick up a few grocery essentials too. 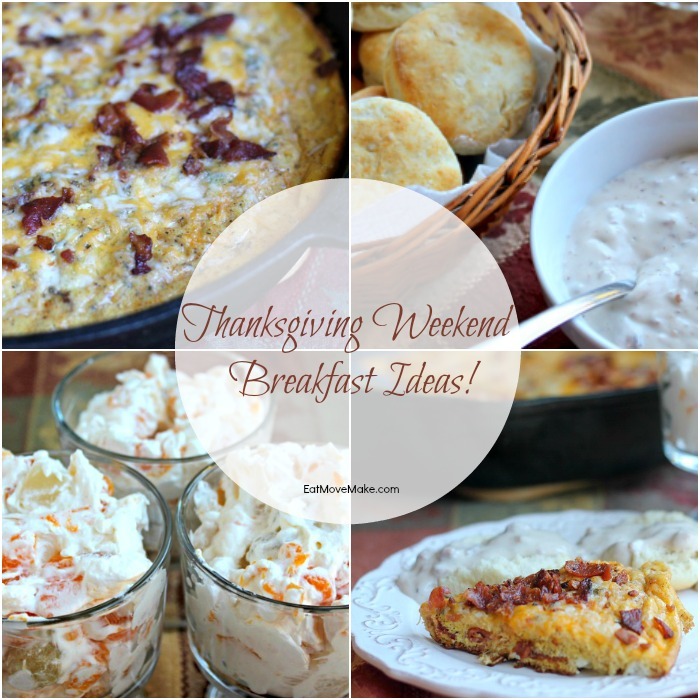 You can use them to put together an impressive and delicious Thanksgiving weekend breakfast! After all, you need a bountiful meal to fuel the family’s weekend decorating, shopping and baking adventures. 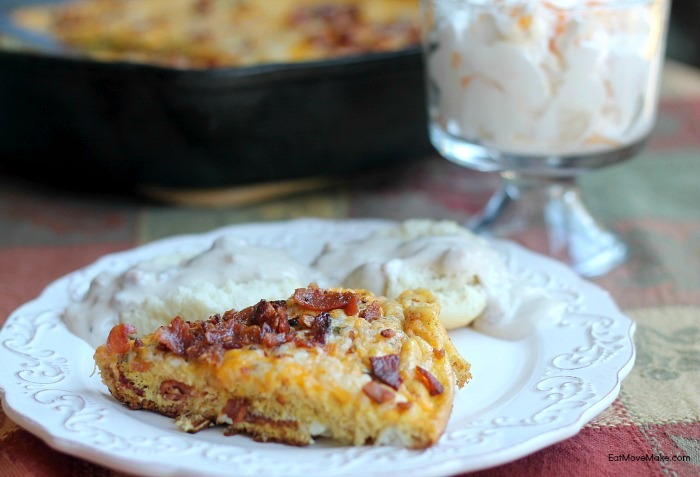 How does a breakfast frittata with bacon and cheese, freshly baked biscuits with sausage gravy and fruit fluff sound? Prepare and bake the biscuits as directed on the box. Set aside. 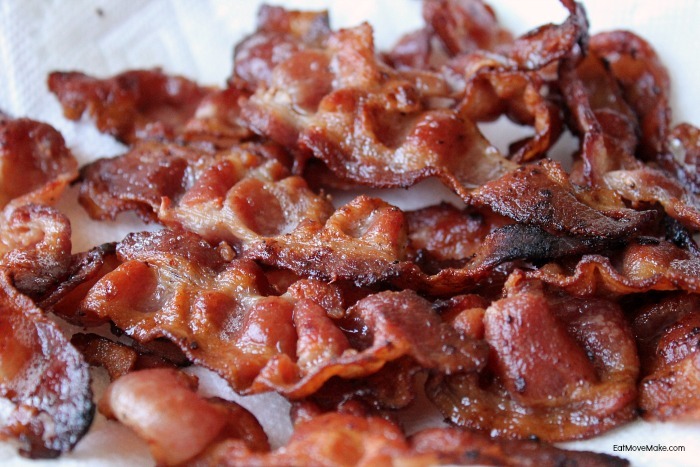 Cook bacon; crumble and set aside. Heat olive oil in a cast iron frying pan on the stove over medium high heat. Crack eggs into a large bowl and beat just until whites and yolks are mixed together. Don’t overbeat. Stir in crumbled bacon (except for reserved portion), salt, pepper, Parmesan cheese, red pepper, parsley, basil and minced onion. Reduce heat slightly, and pour egg mixture into pan and cook for about 5-7 minutes or until the edges begin to pull away from sides of pan. 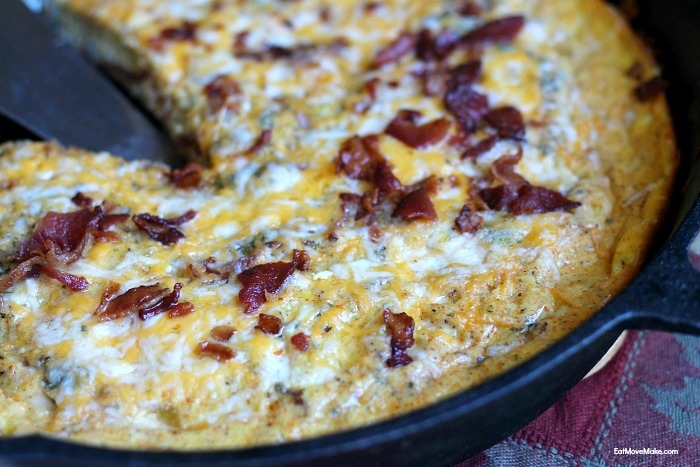 Place frittata into preheated oven and bake for about 15-18 minutes, sprinkling shredded cheese and remaining bacon on top during the last few minutes of cooking. Cut into wedges; serve warm. Add fruit to large bowl and mix together. 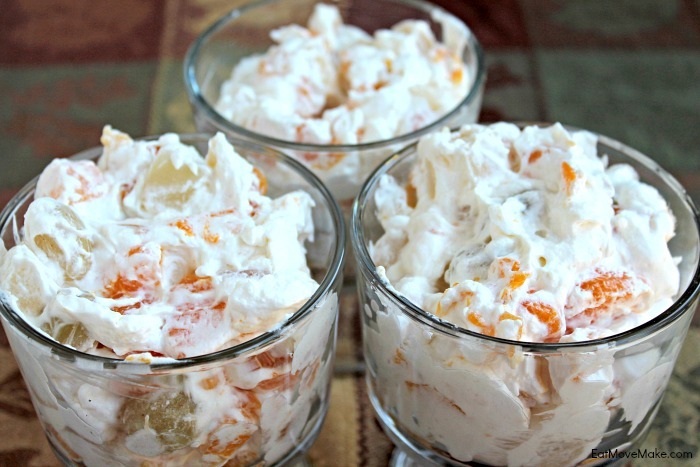 Add whipped topping and gently toss to coat. Spoon into dessert cups. Heat sausage gravy. Pour into bowl with spoon to serve. Heat olive oil in a cast iron frying pan on the stove over medium high heat. Crack eggs into a large bowl and beat just until whites and yolks are mixed together. Don't over beat. Stir in crumbled bacon (except for reserved portion), salt, pepper, Parmesan cheese, red pepper, parsley, basil and minced onion. Reduce heat slightly, and pour egg mixture into pan and cook for about 5-7 minutes or until the edges begin to pull away from sides of pan. Enjoy an amazing breakfast, and then head to Family Dollar to take advantage of all the Thanksgiving weekend sales and deals! Be sure to sign up for Smart Coupons for additional savings and check back frequently for new offers. 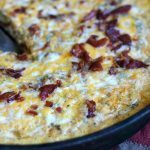 On weekends I love to make brunch recipes, so I made this kickin’ Tex-Mex breakfast bake recipe for the family the other day. The kick comes from some chiles and a little cayenne pepper, and you can turn that up a notch or down a notch according to taste. 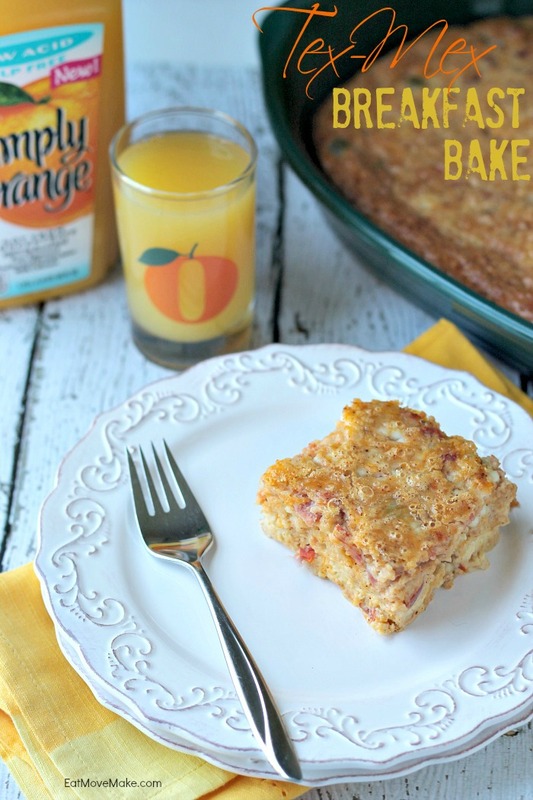 This Tex-Mex breakfast bake recipe was created in partnership with Simply Orange, but all opinions expressed are my own. 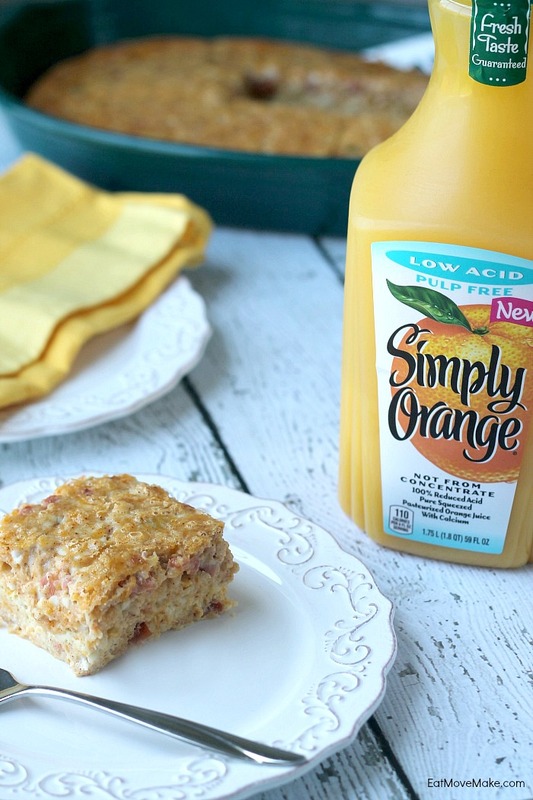 Either way, the perfect accompaniment to this delicious breakfast bake is orange juice, and since Simply Orange launched the new Simply Orange Low Acid, I can have some! Orange juice is so delicious, but I’m sensitive to the acidity, so I tend to avoid it. But, I can have the new low acid orange juice whenever I want. It’s the next best thing to fresh squeezed! The reduced acid gives it such a smooth, mild, delicious taste, and just like the other Simply Orange varieties, it’s never sweetened, never concentrated and never frozen. 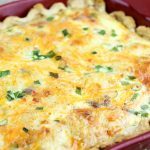 It goes great with this Tex-Mex breakfast bake recipe, but it’s also perfect in a glass on its own. Brush melted butter on bottom and sides of a 9x13x2-inch baking dish. In large bowl, whisk eggs. Whisk in cheeses, flour and salt. Stir in tomatoes. Pour into baking dish. Bake 50 - 60 minutes, or until set and golden on top. 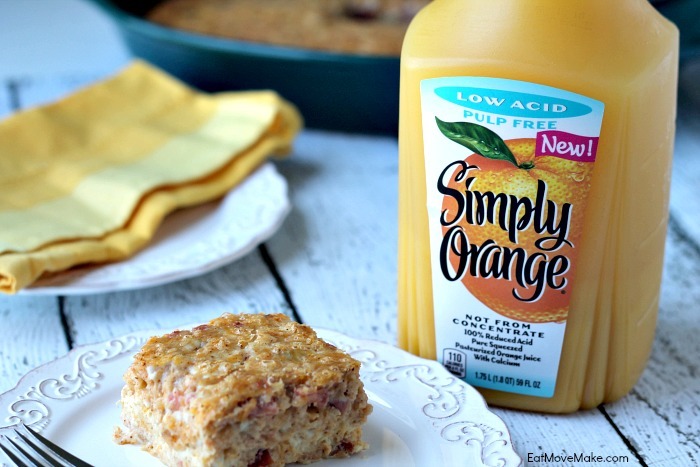 If you love the great taste of orange juice, but are sensitive to acid like me, try the new Simply Orange Low Acid! Learn more and get Simply inspirations and recipes by liking the Simply Facebook page or visiting the official website. 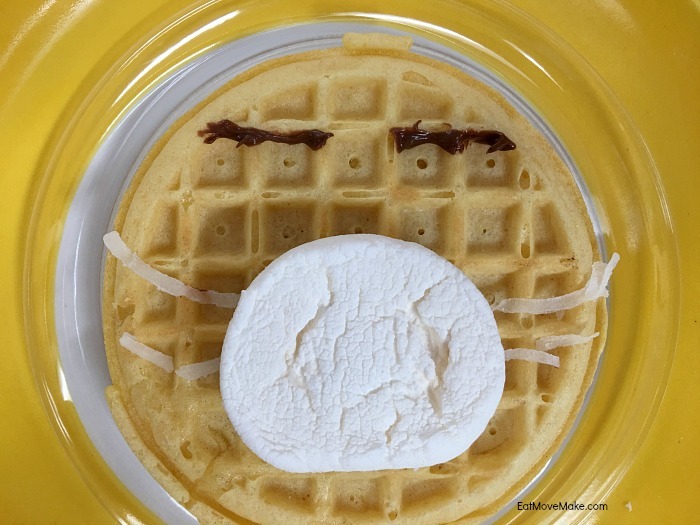 Eggoji Emojis – A New Way To Play With Your Food! 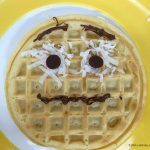 This blog post was sponsored by Eggo, but the opinions are completely my own based on my experience. 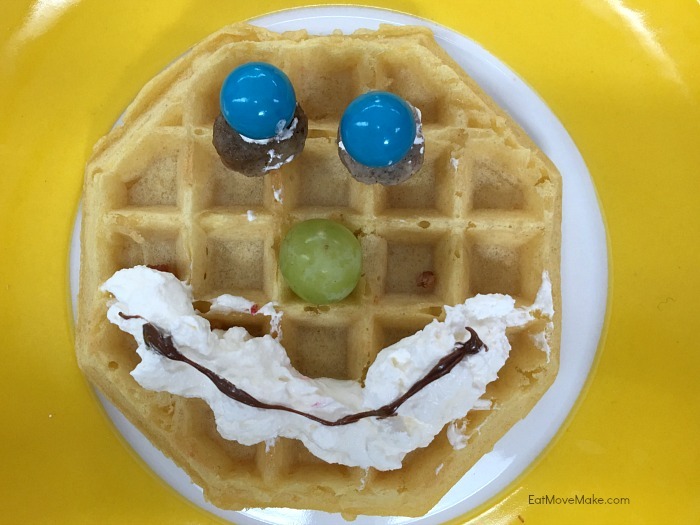 A couple of weeks ago, I flew to San Jose for an exciting, emoji-ful day of warm and fluffy Eggo waffles. In fact, I’d say it was Eggoji-ful! You probably think I’m just trying to be corny, but it’s actually a hint to what I’ve been hiding ever since my Eggo experience. 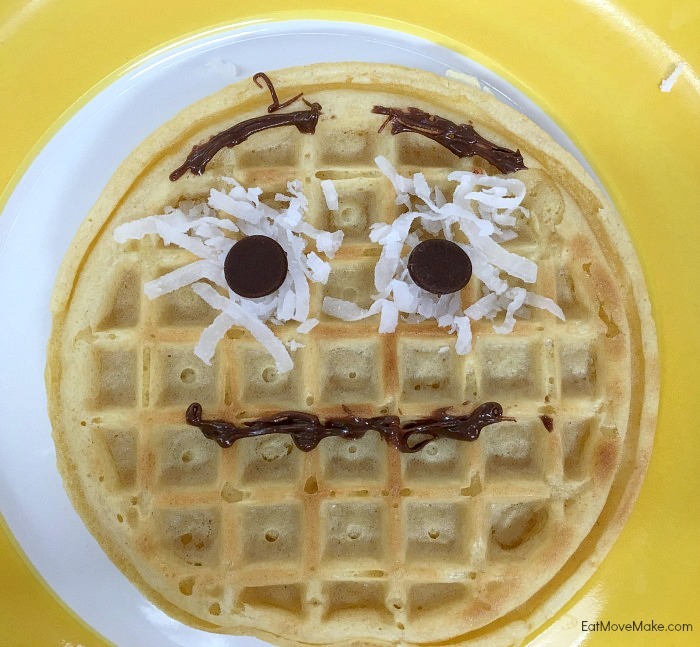 When visiting Eggo HQ, they presented us with waffle decorating inspiration the likes of which I never could have imagined, and then they let us get creative and make our own Eggoji right on top of our golden, crispy and delicious waffles. How mouthwateringly delicious is that? Do you feel sick with jealousy right now that you weren’t there making Eggojis with me? So have you figured it out? Aren’t they fun? This is just a sneak peek too… there will be even more. So download the Eggoji app and start expressing your emotions and Eggo-nality in the newest, funnest way!